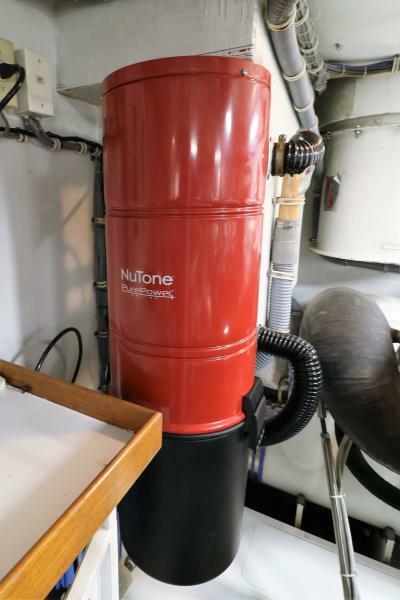 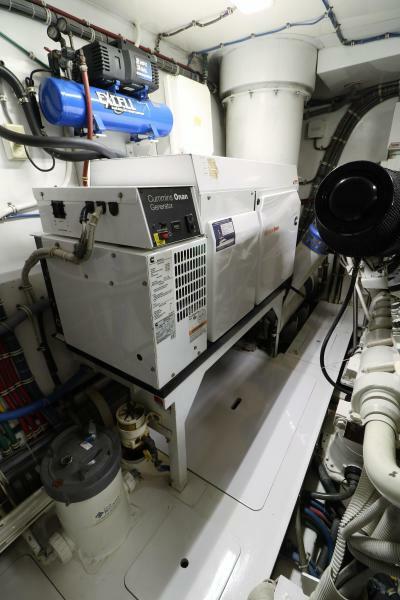 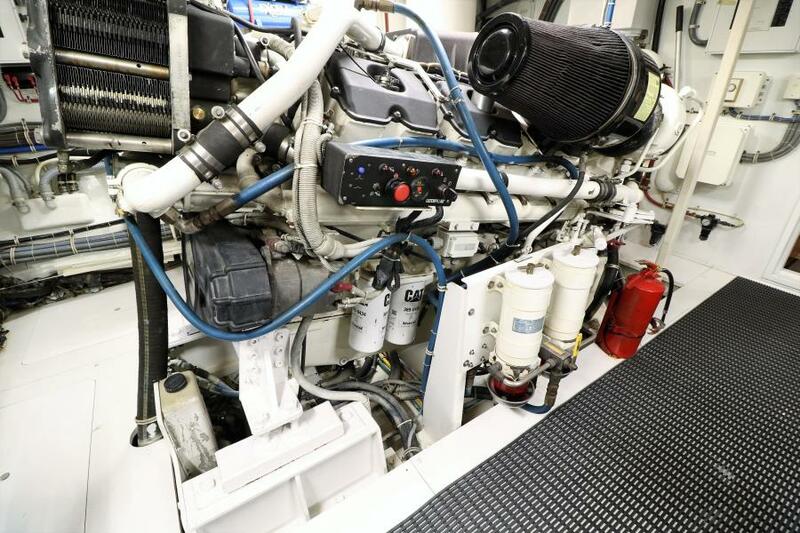 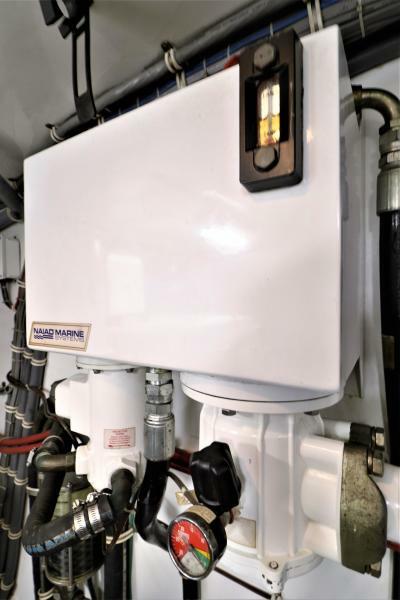 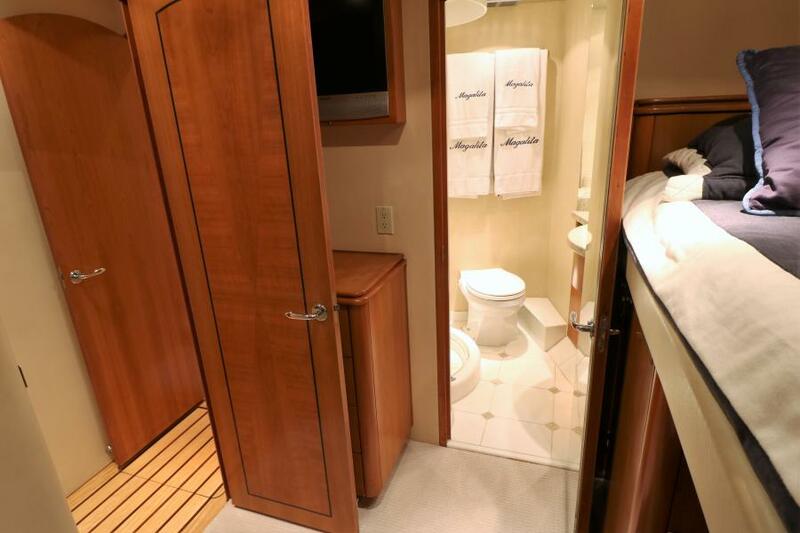 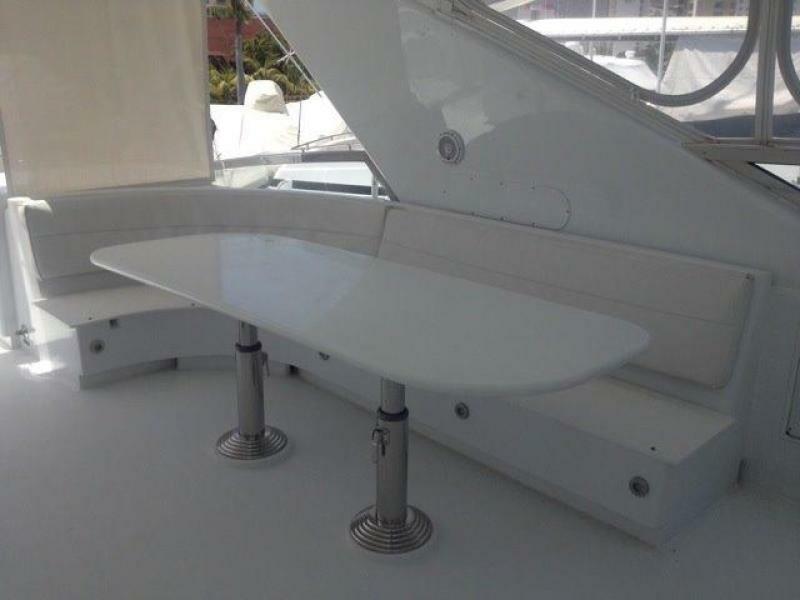 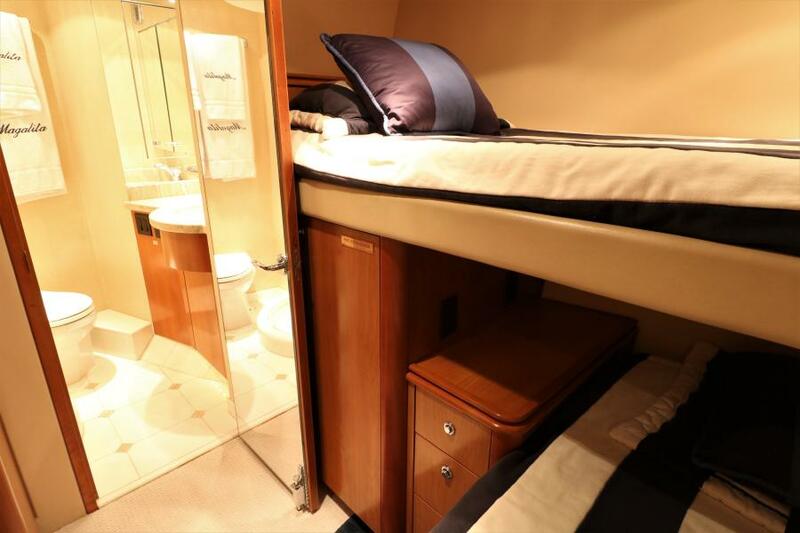 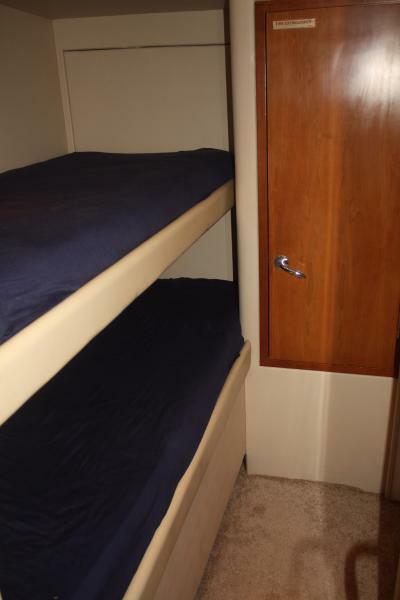 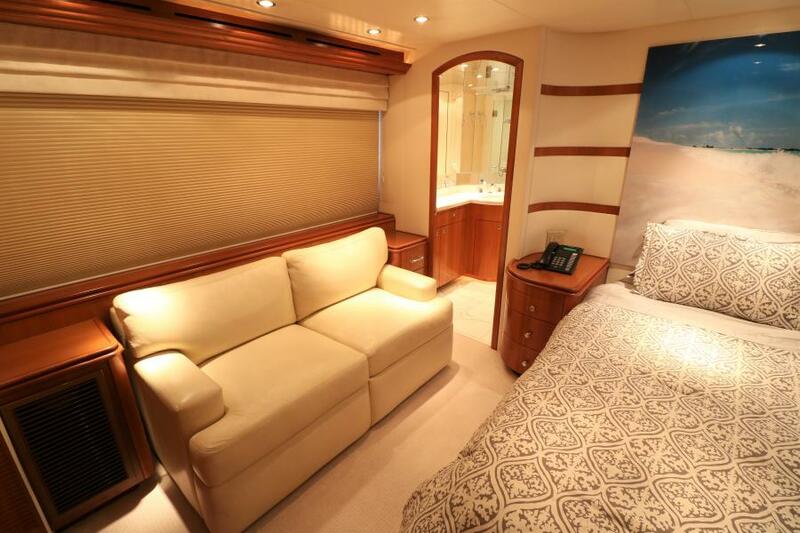 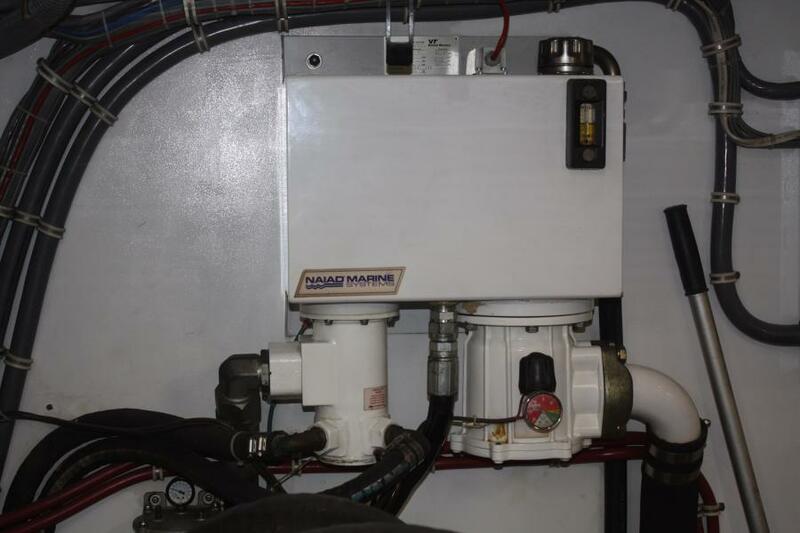 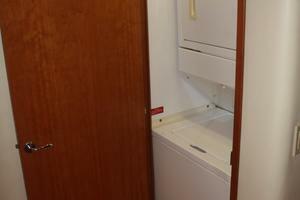 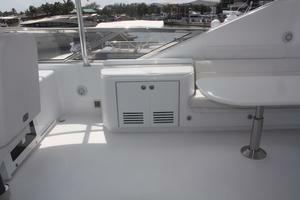 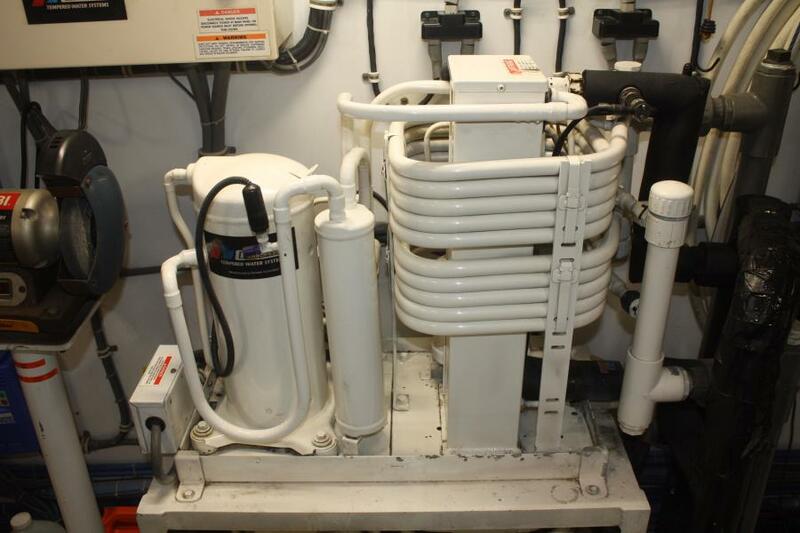 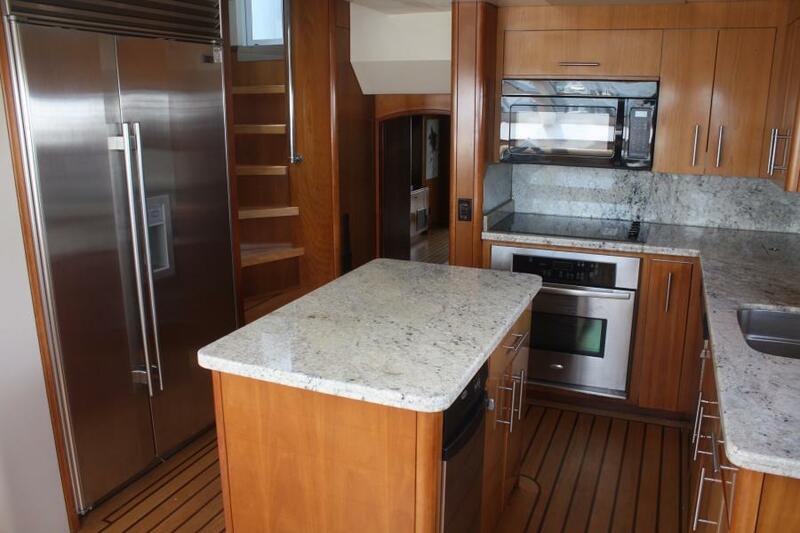 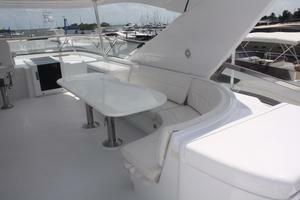 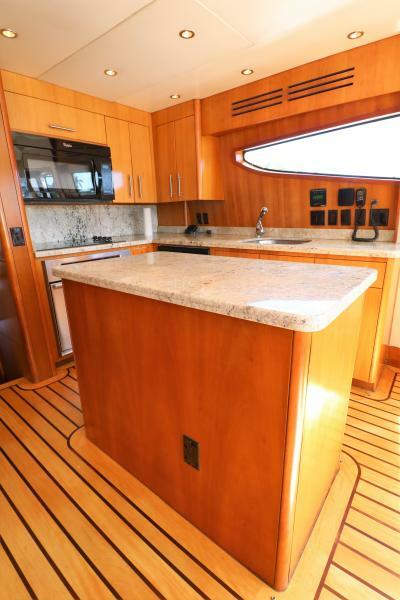 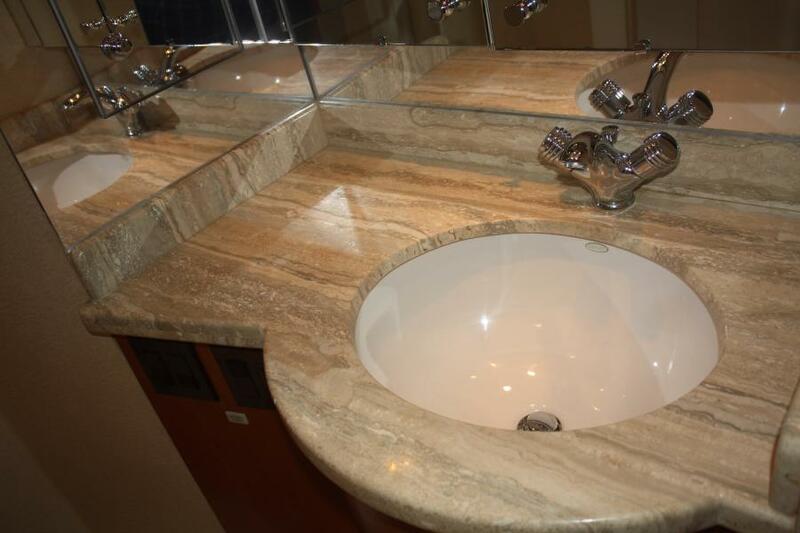 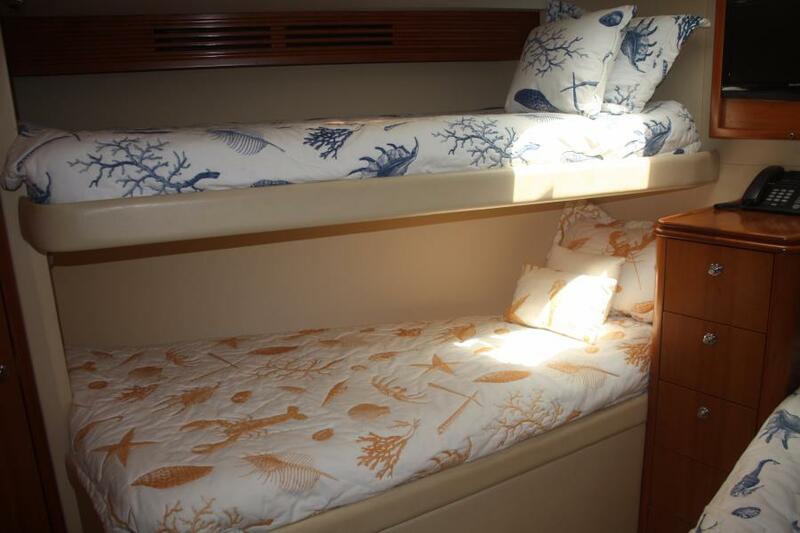 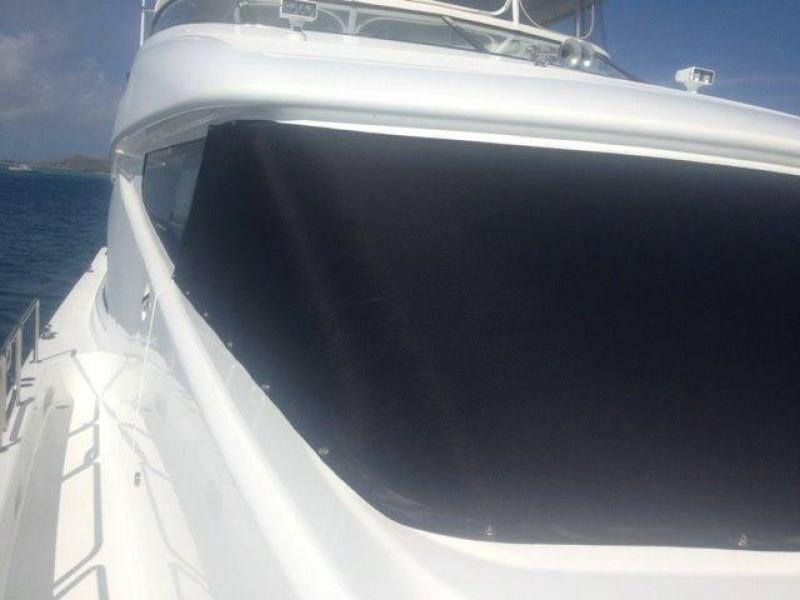 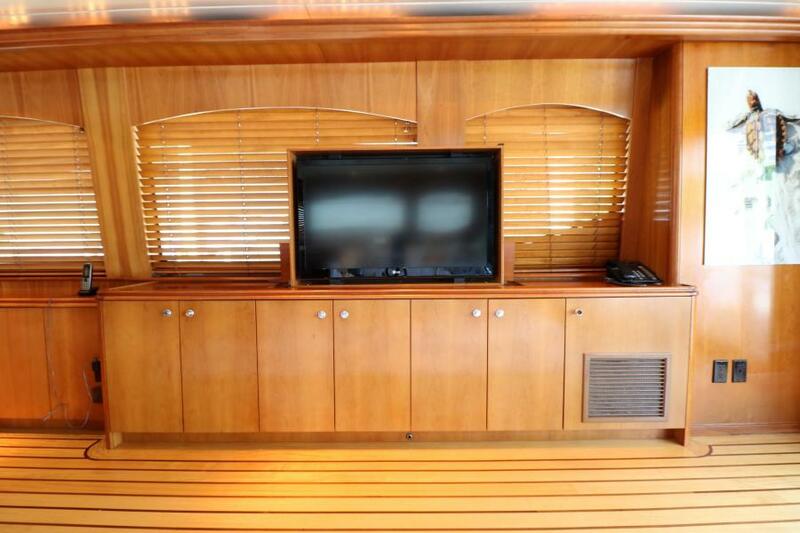 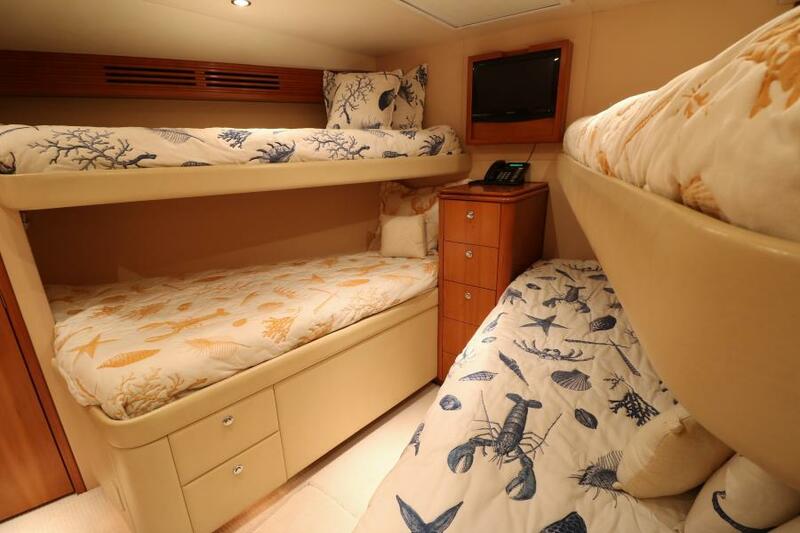 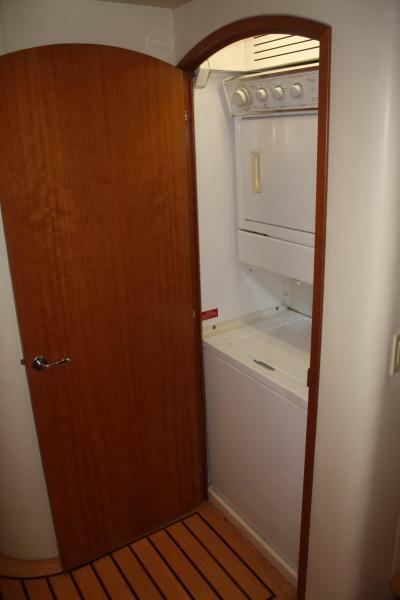 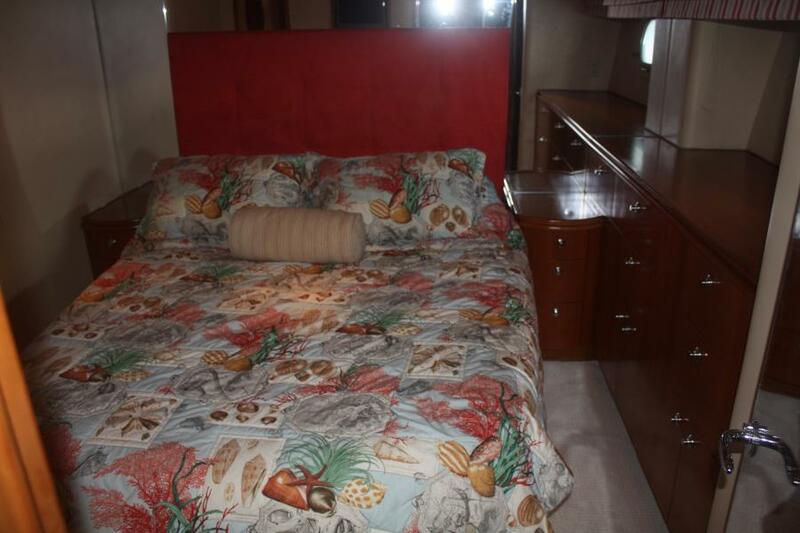 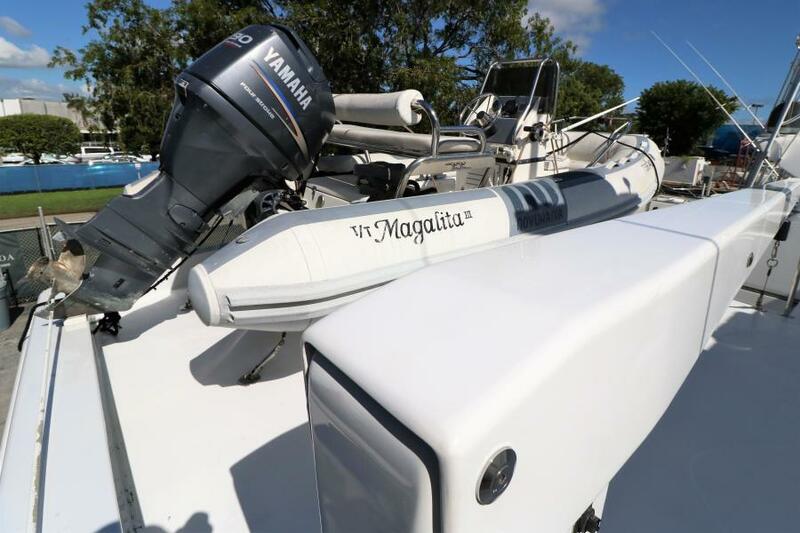 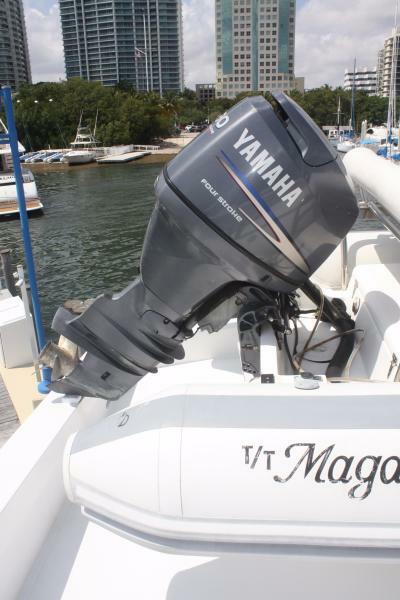 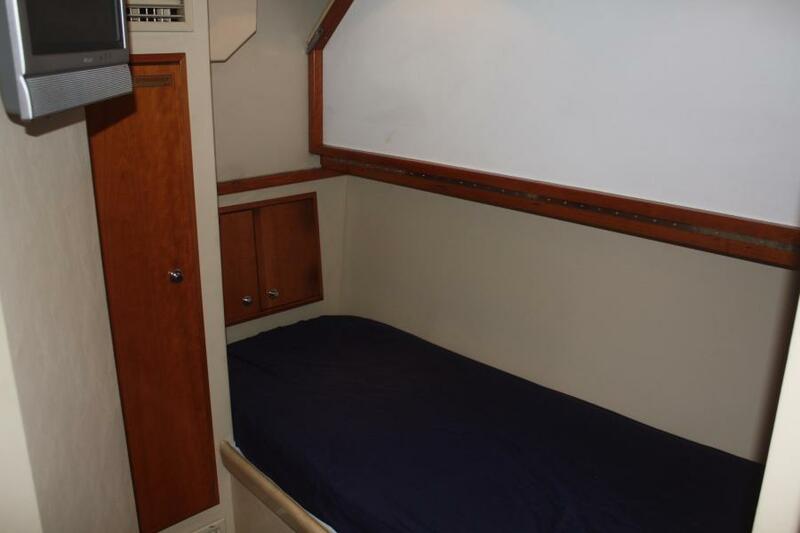 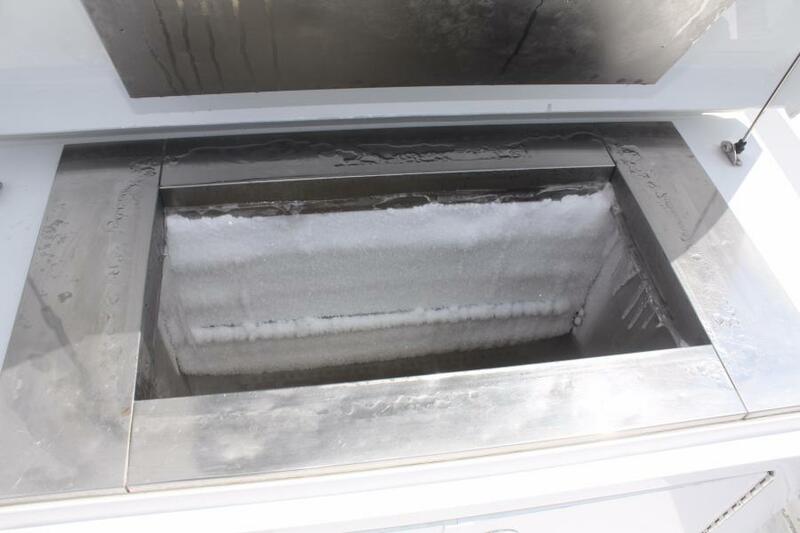 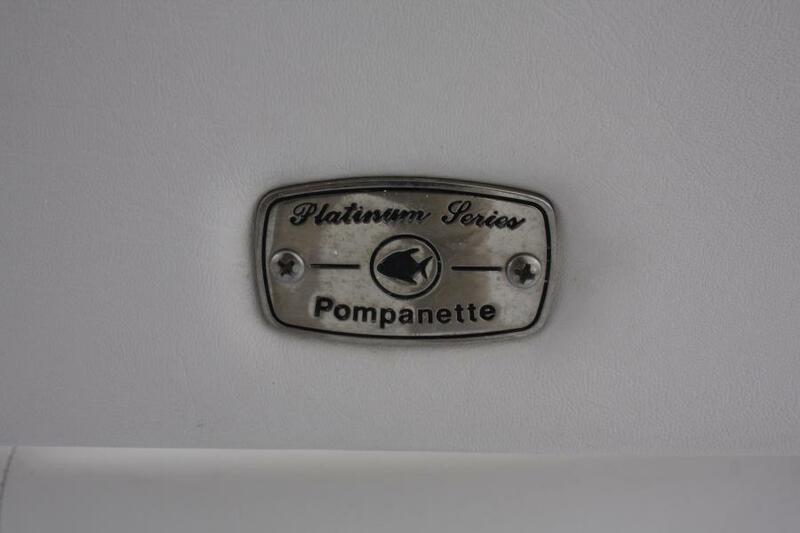 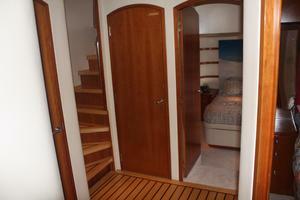 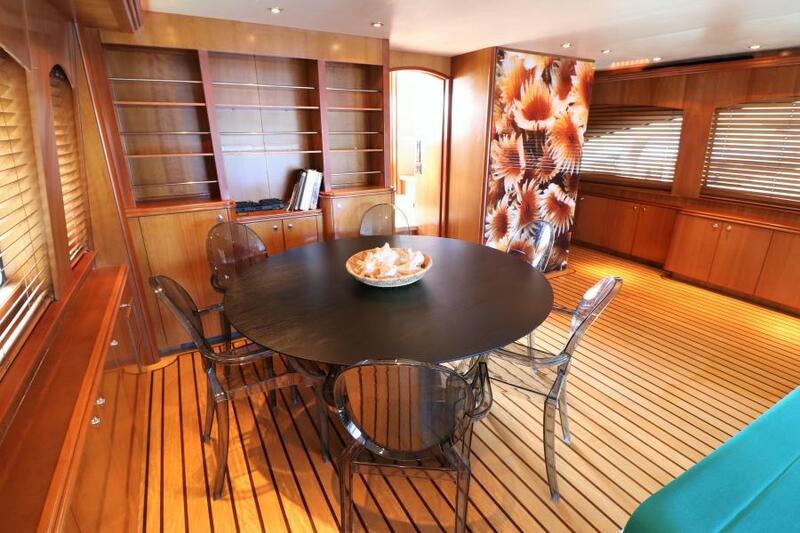 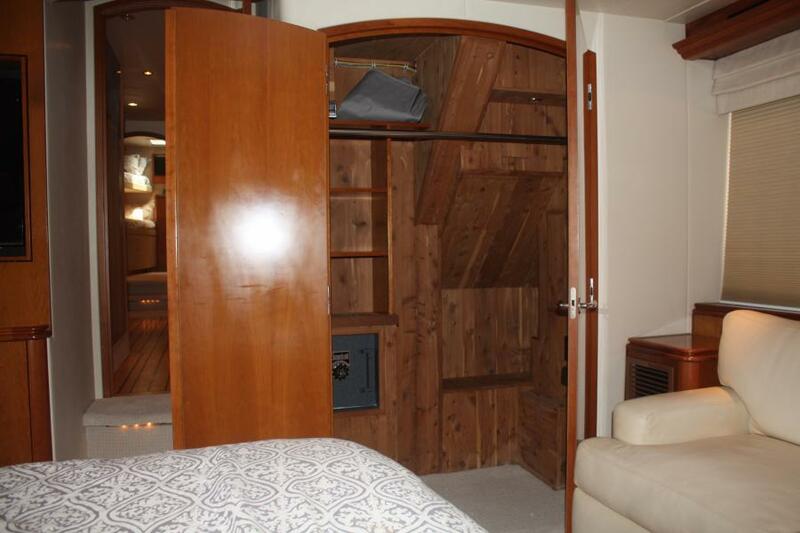 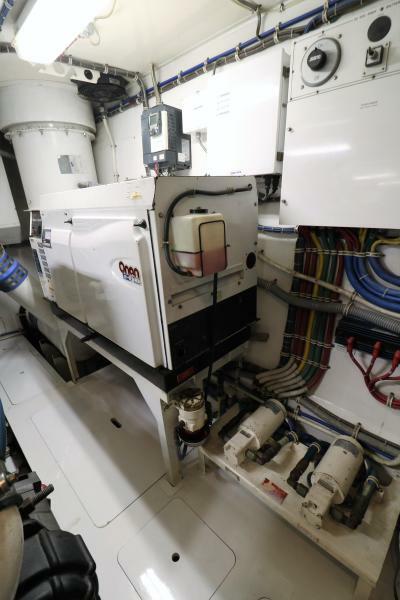 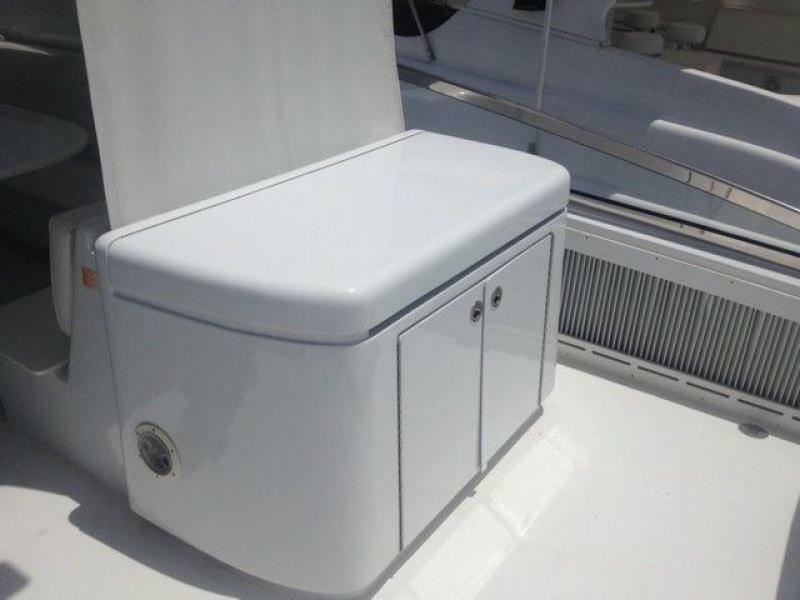 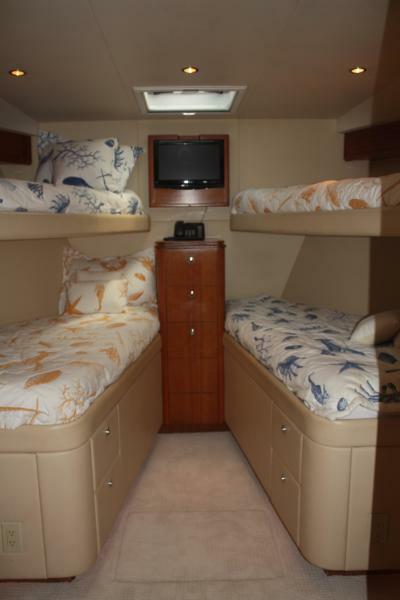 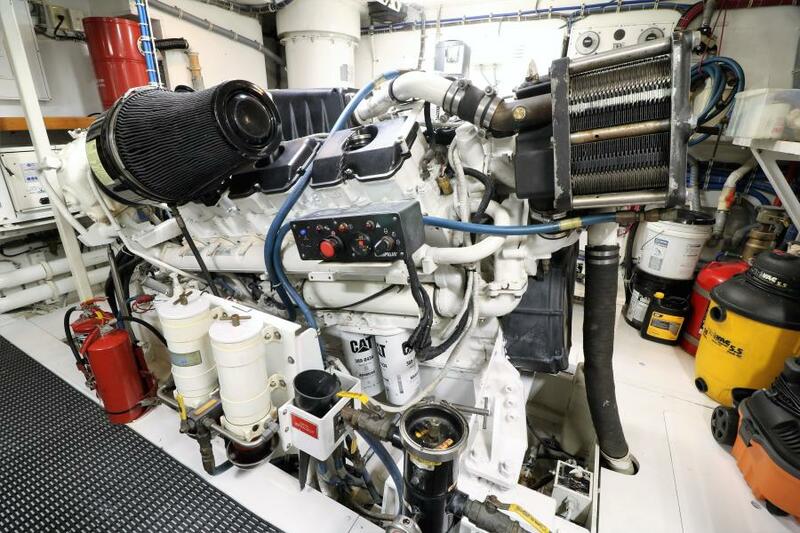 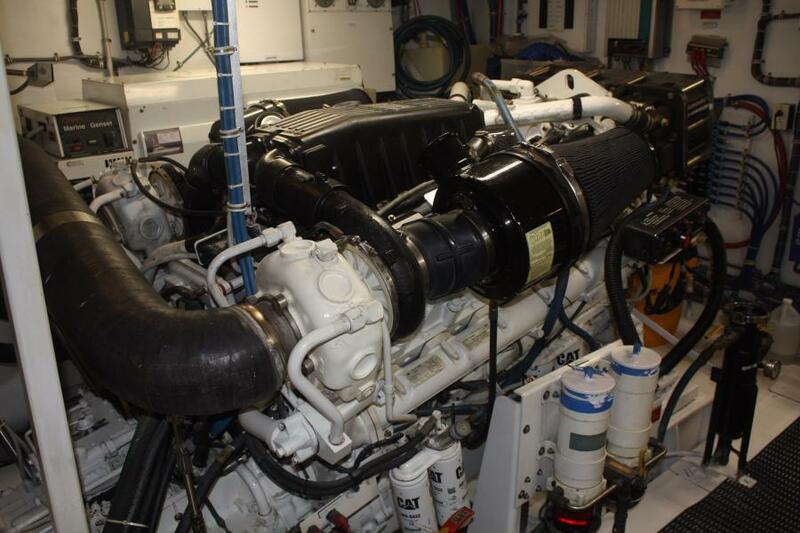 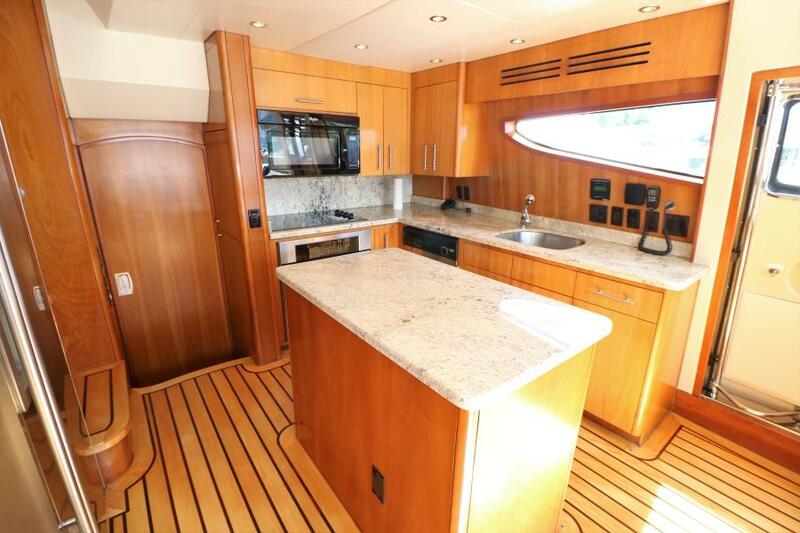 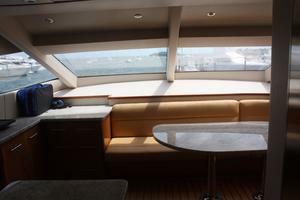 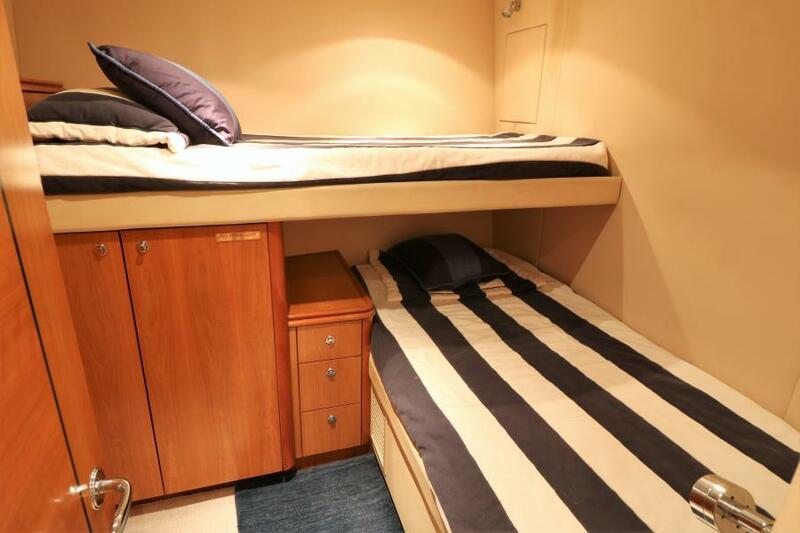 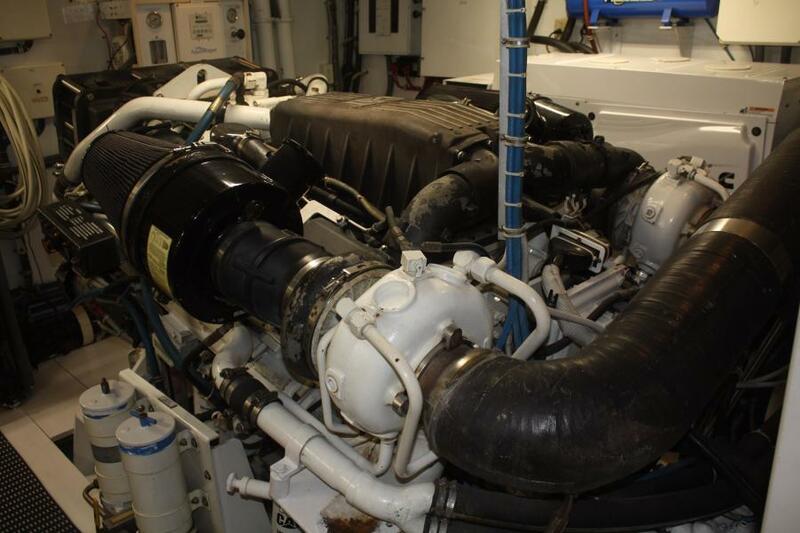 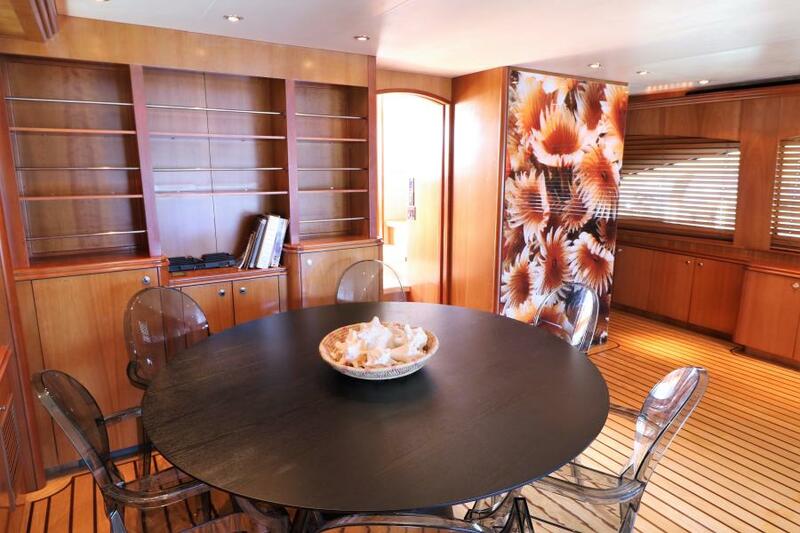 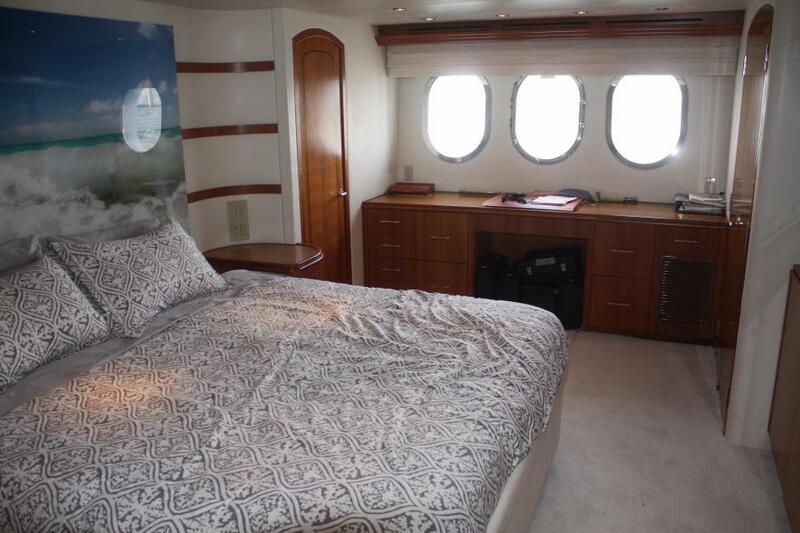 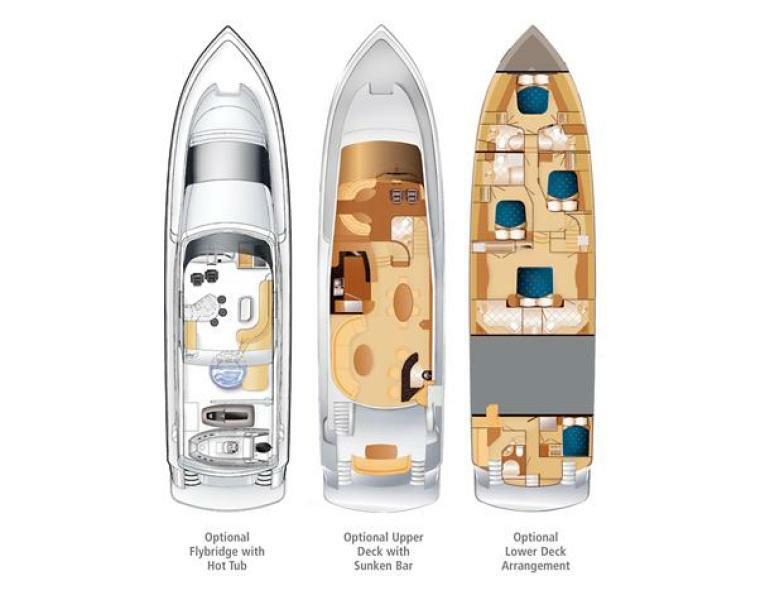 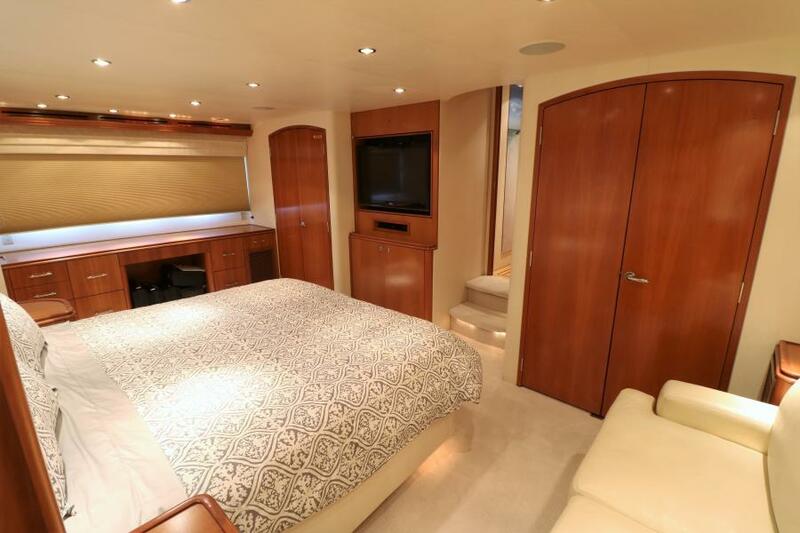 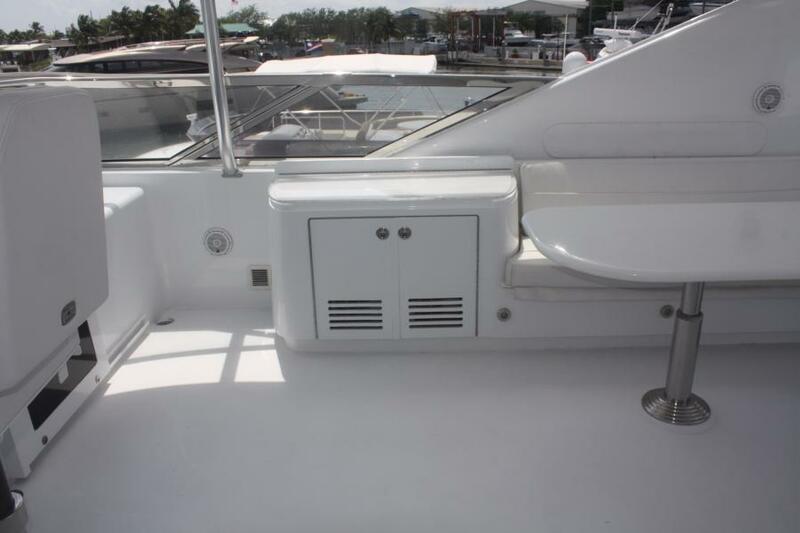 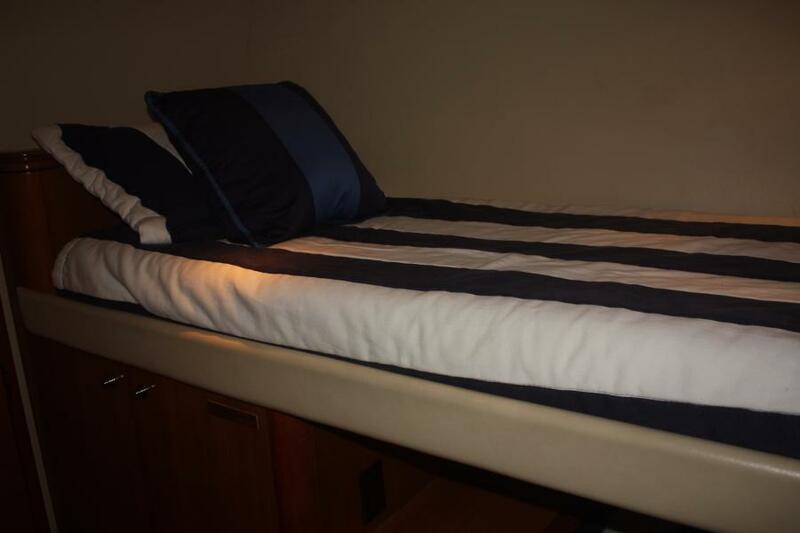 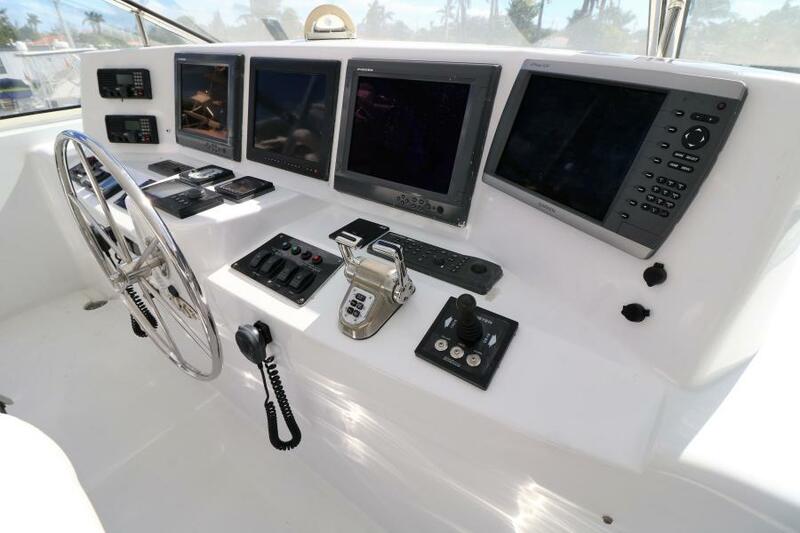 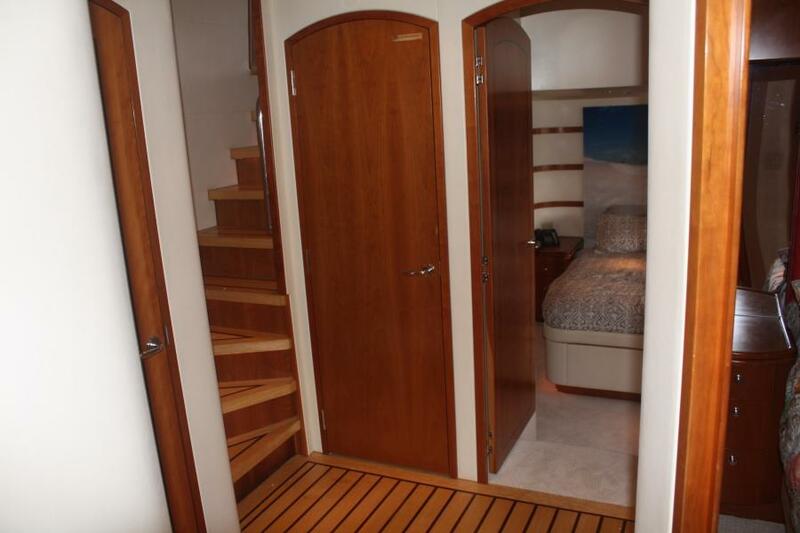 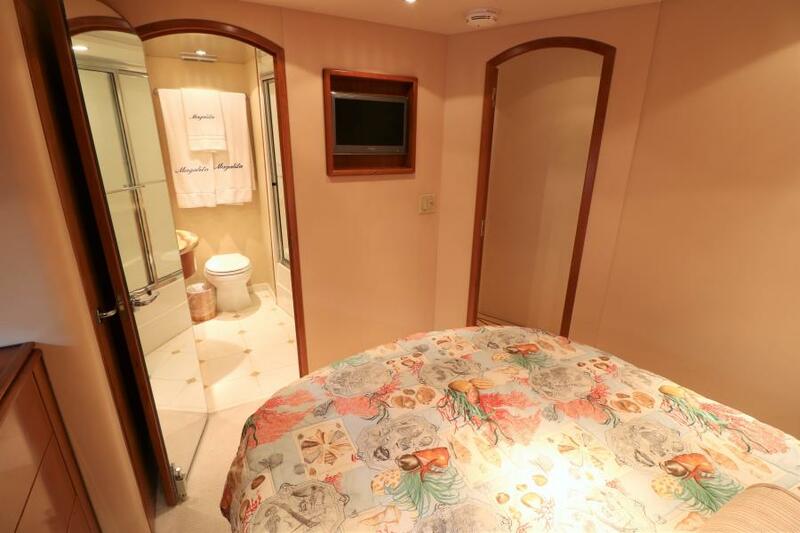 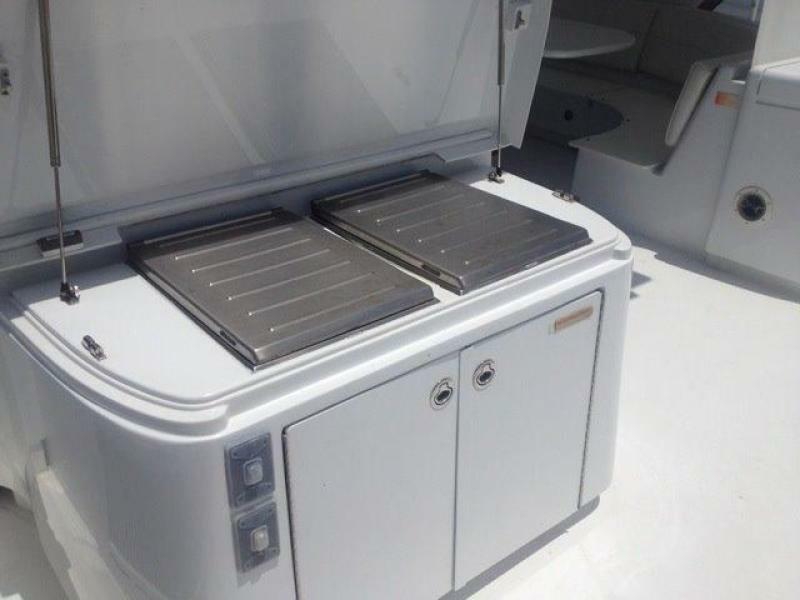 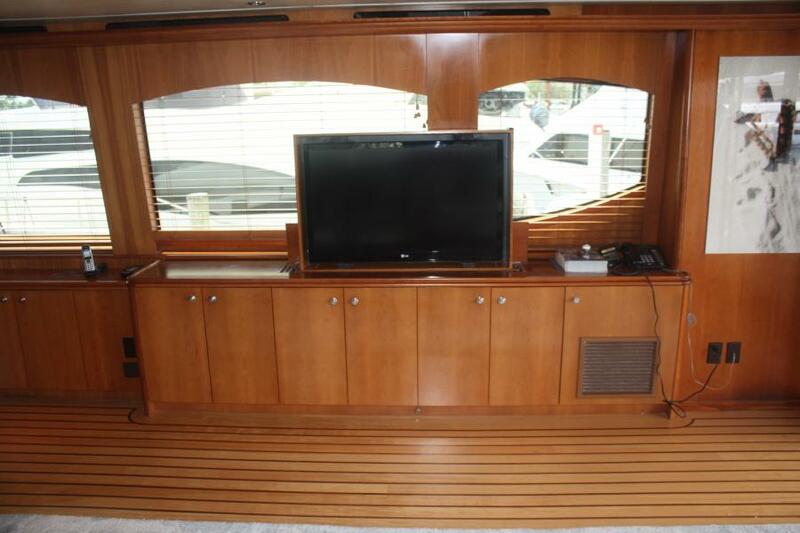 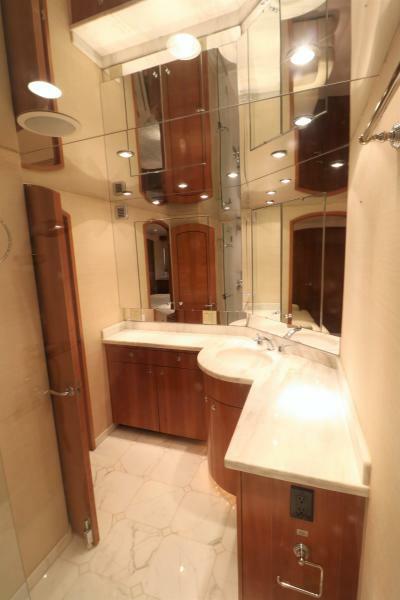 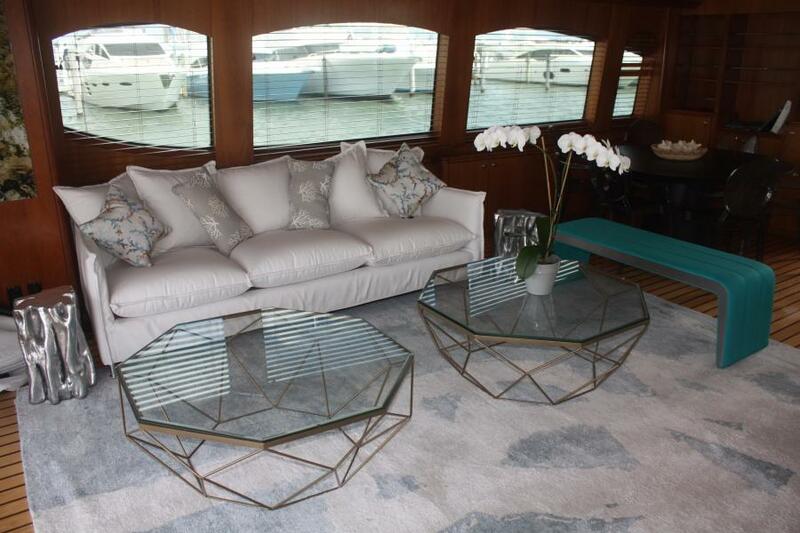 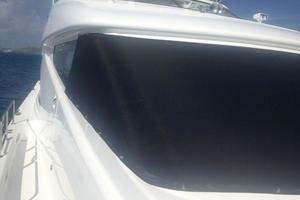 TURN KEY BOAT, NEW ENCLOSURE IN FLYBRIDGE FULL SEVICE IN ENGINES NEW CHILLER AND MAYOR SERVICE IN A/C FULL SERVICE FIRE SYSTEM NEW COOK TOP NEW CARPETS in all cabins and crew quarters New Dinnete seating cushions and backrests VARNISH WORK in galley wood floor, steps and salon. 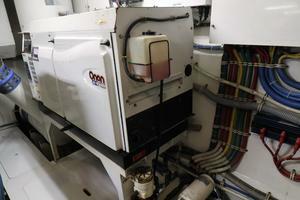 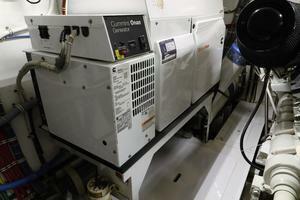 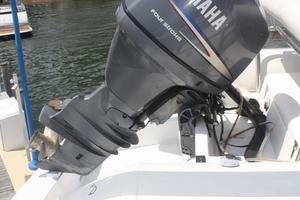 One gen. new 2014, 3600 hrs. 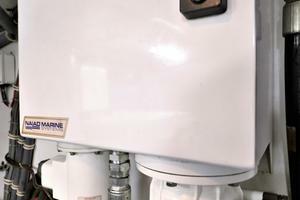 NIADS serviced. 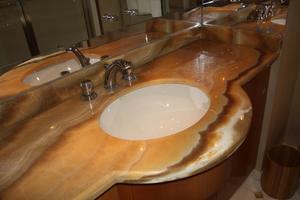 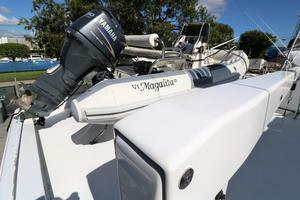 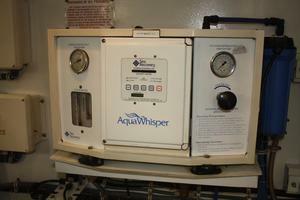 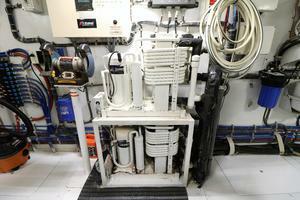 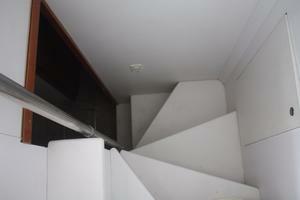 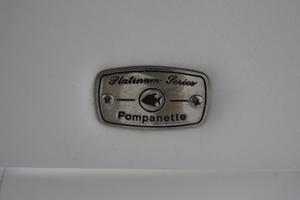 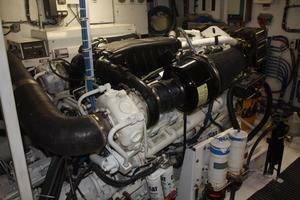 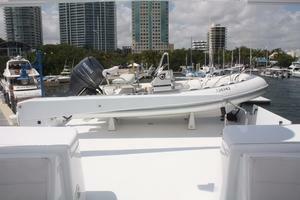 FULL OPERATIONAL Not for Sale to US Residents while in US waters Interior pristine condition. 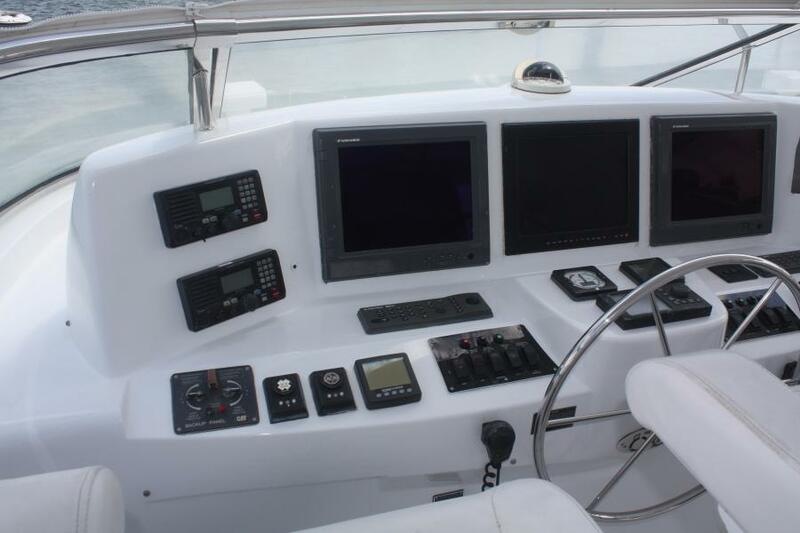 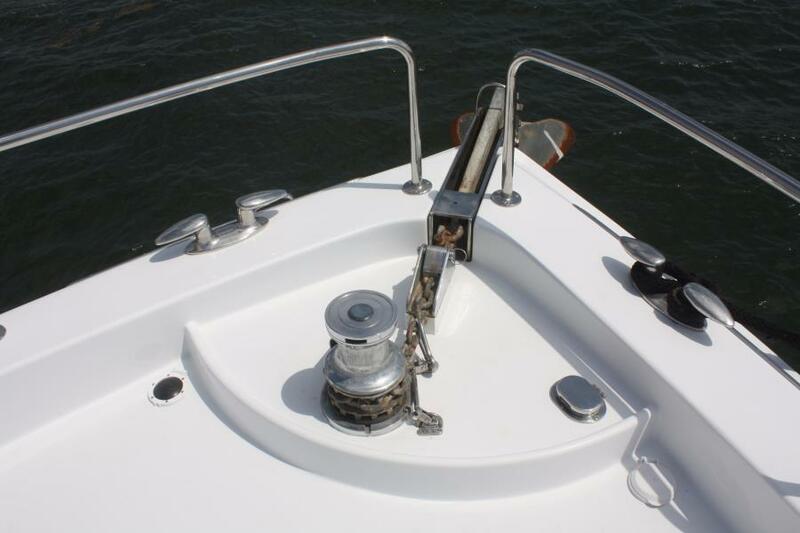 United Yacht Sales New Jersey would love to guide you through a personal showing of this 80' Hatteras 80 Motor Yacht 2006. 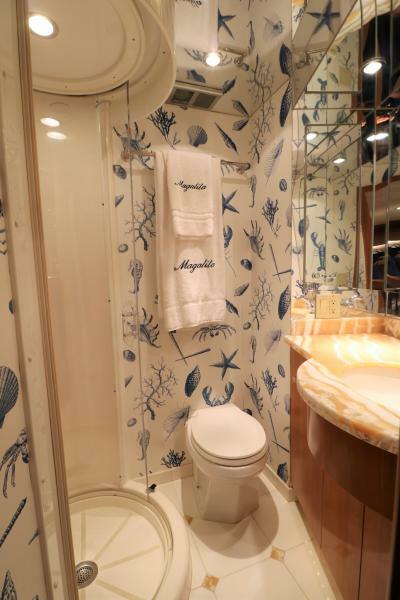 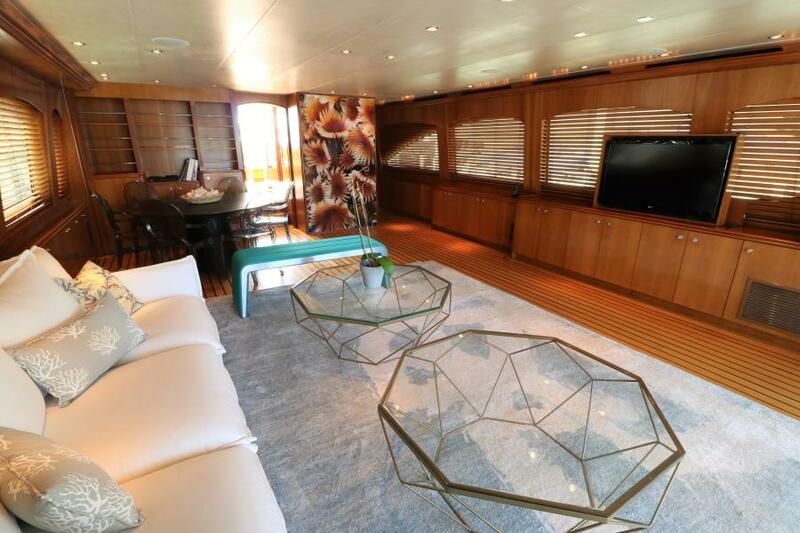 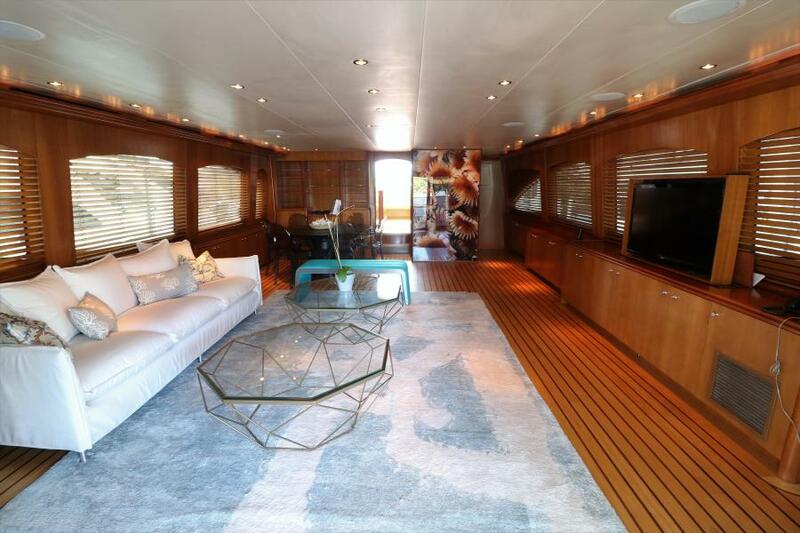 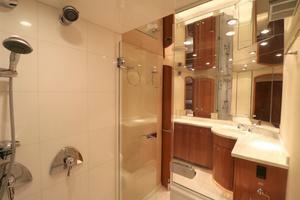 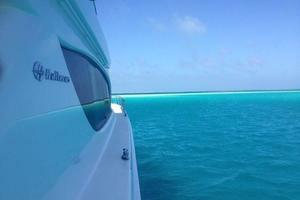 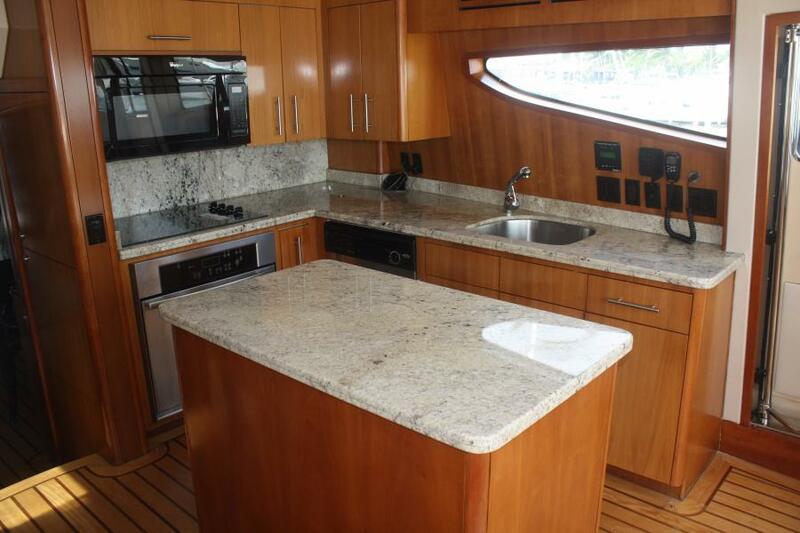 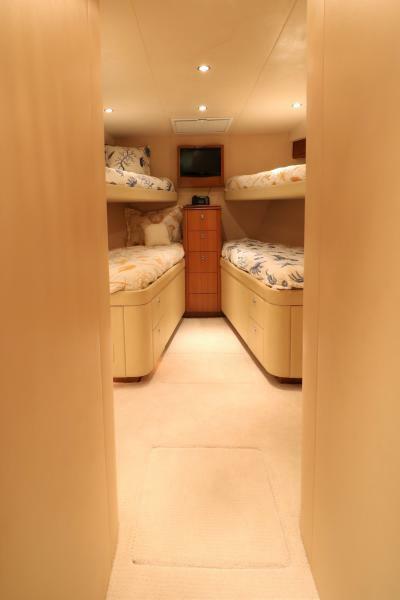 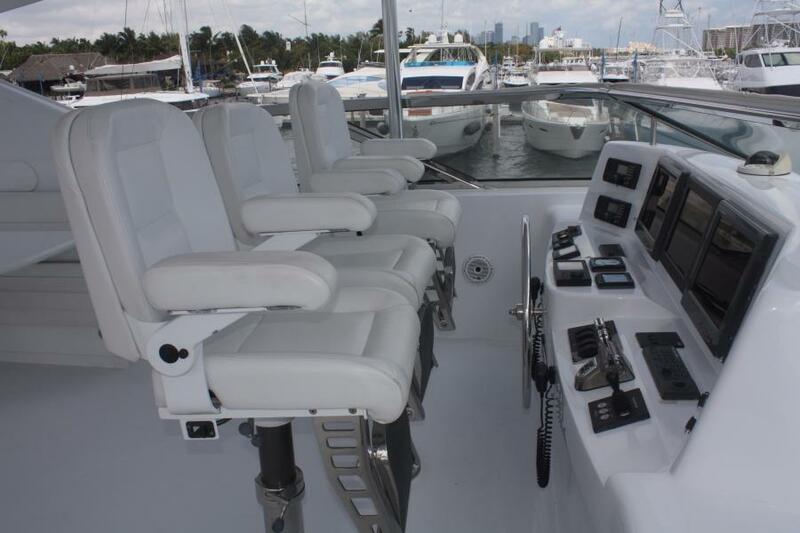 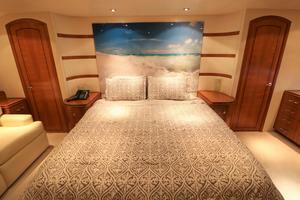 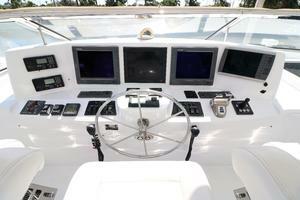 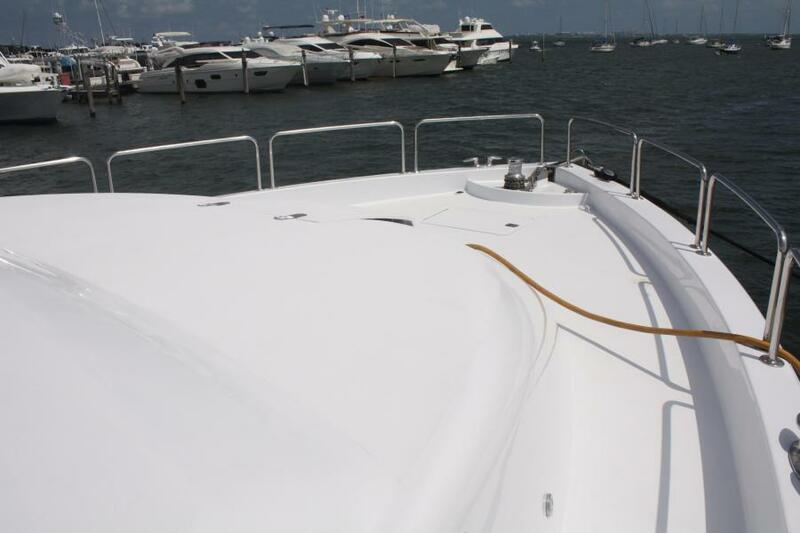 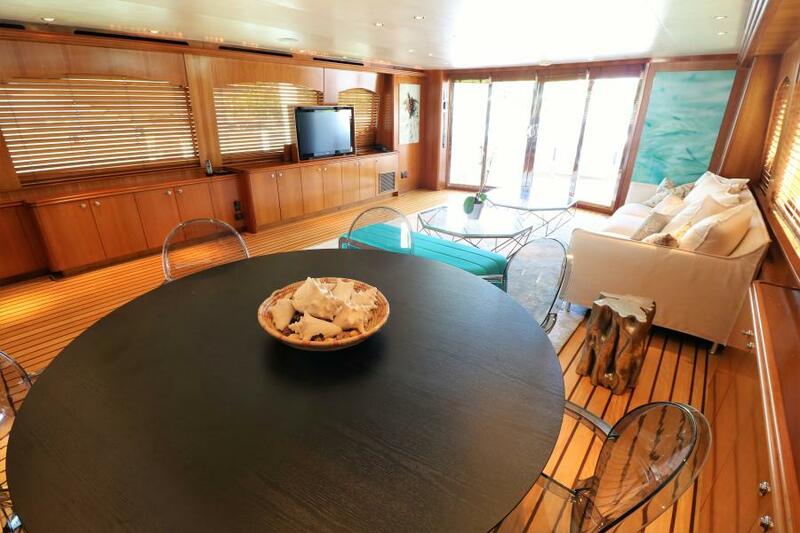 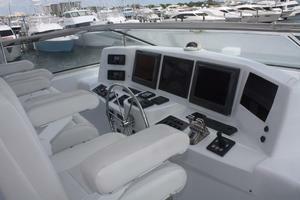 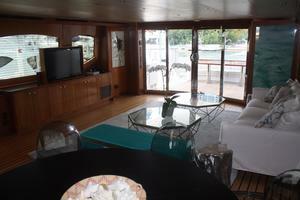 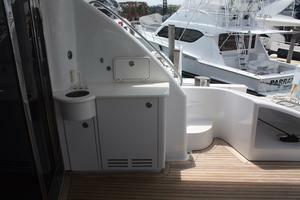 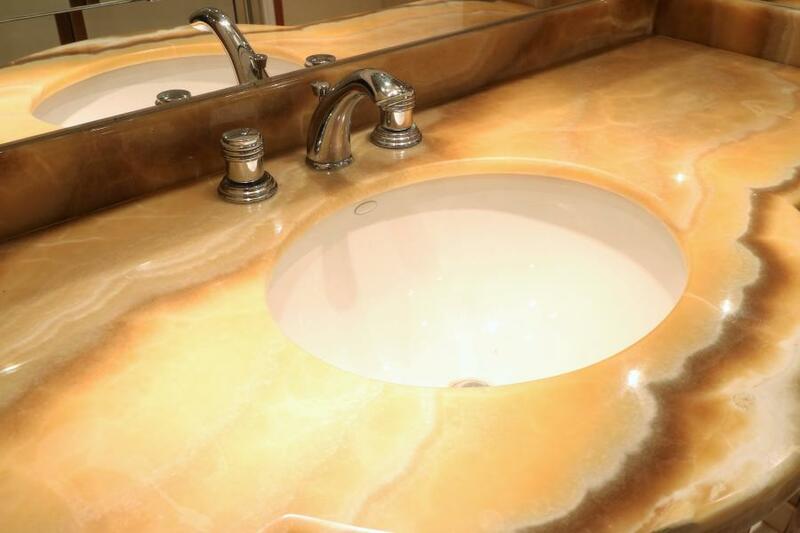 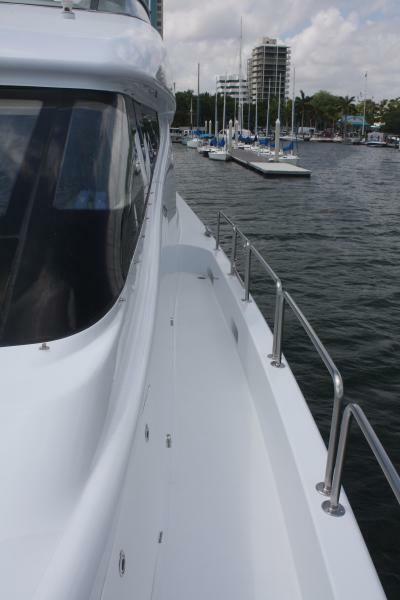 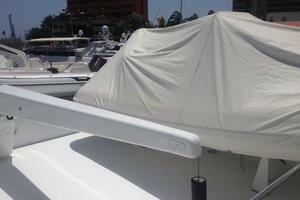 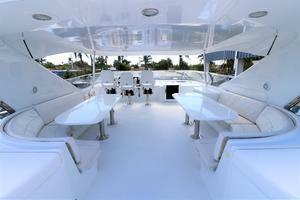 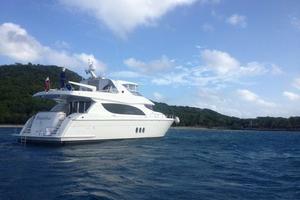 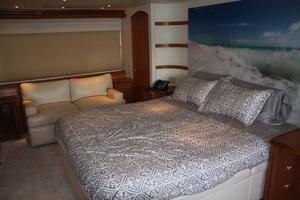 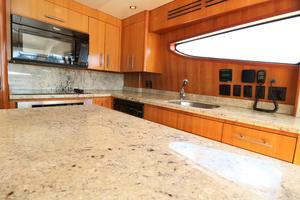 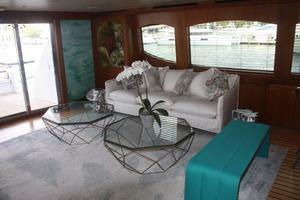 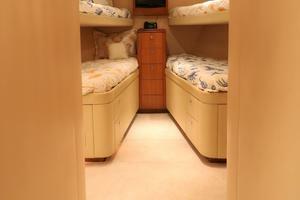 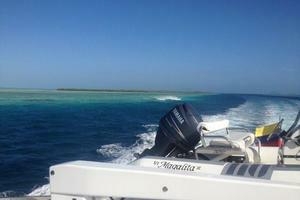 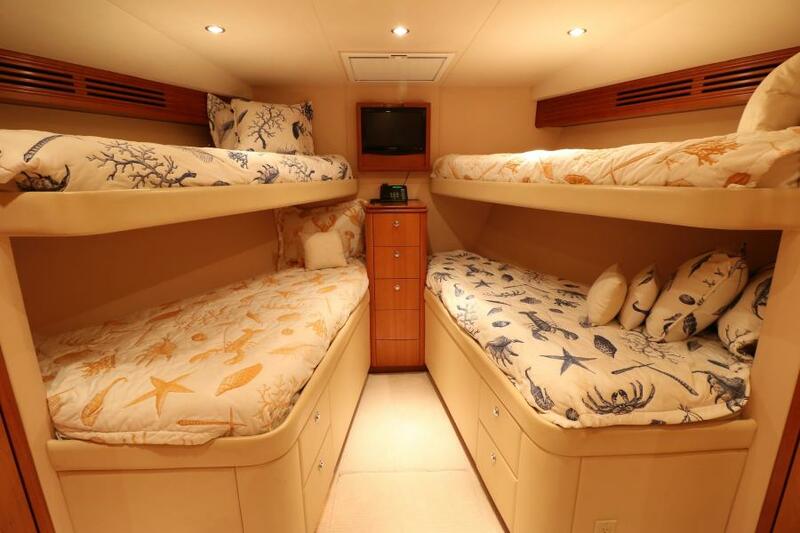 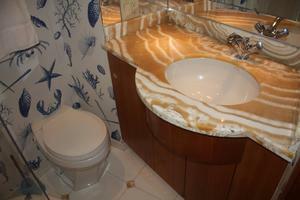 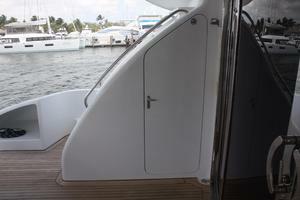 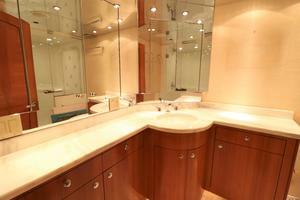 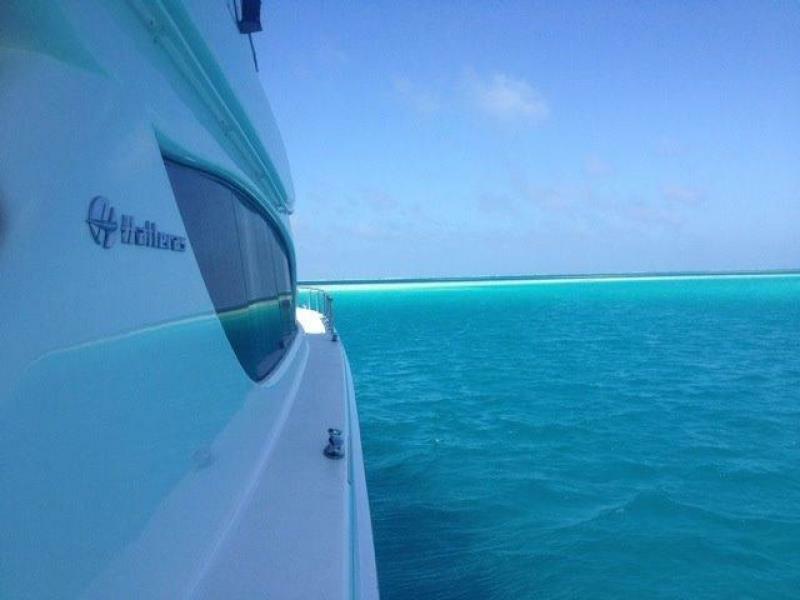 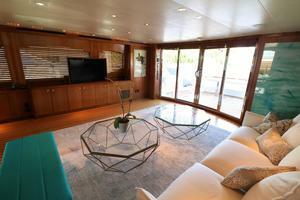 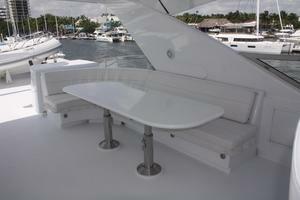 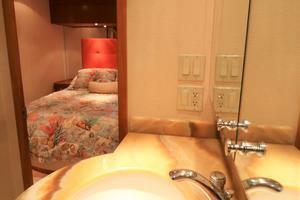 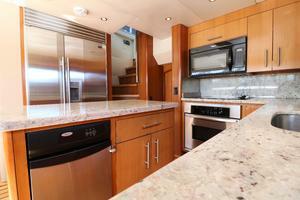 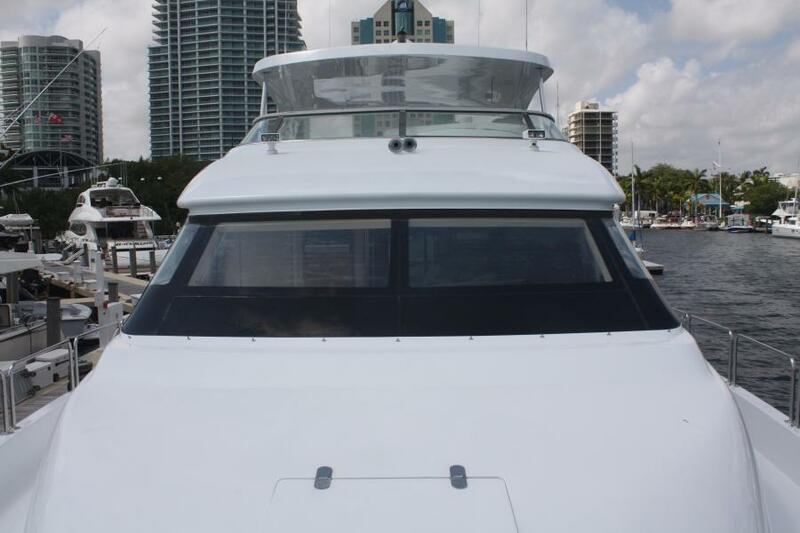 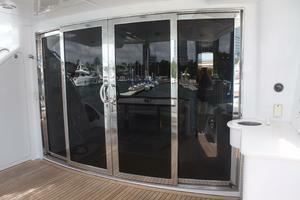 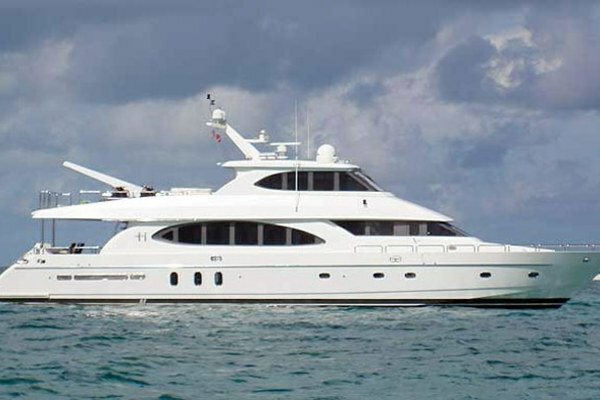 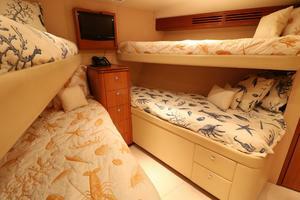 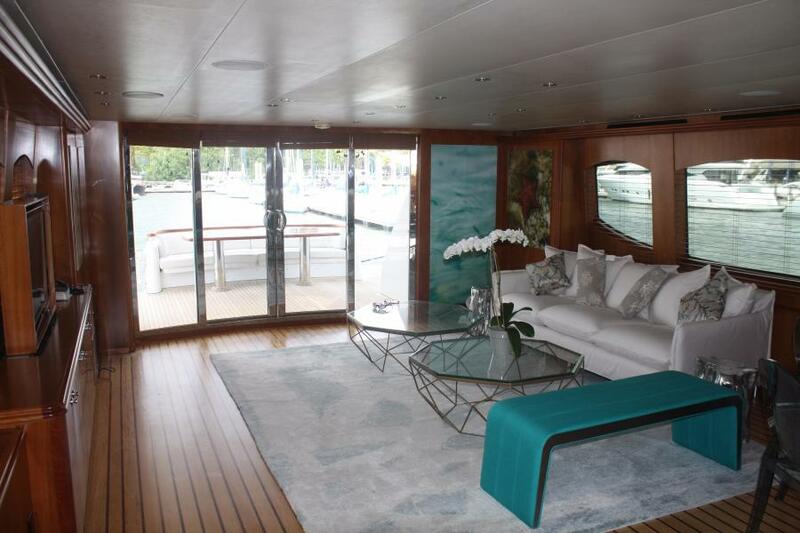 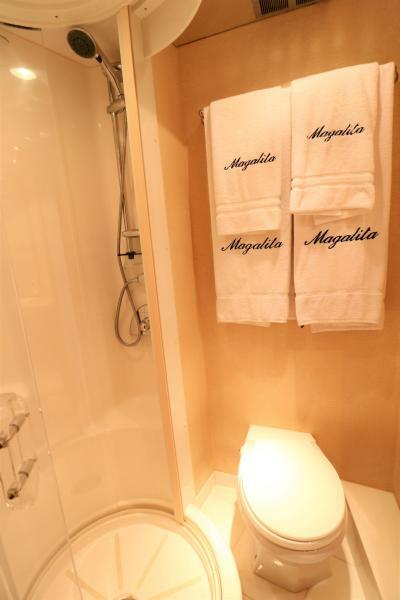 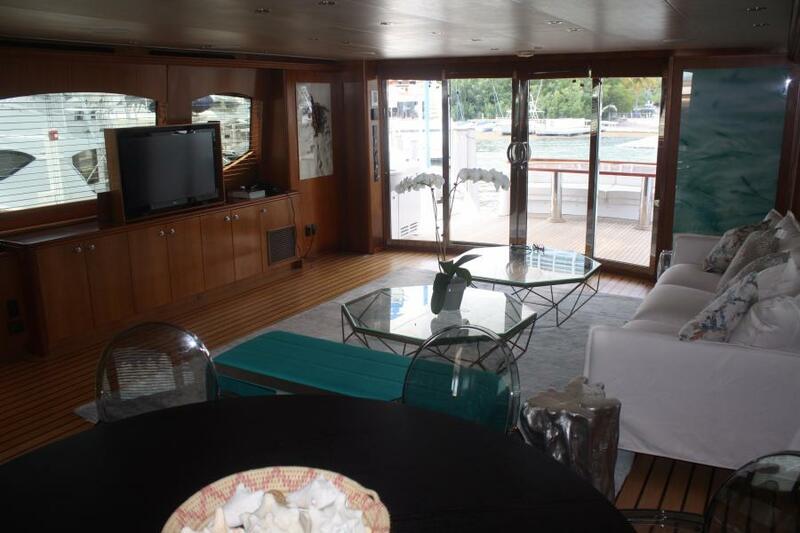 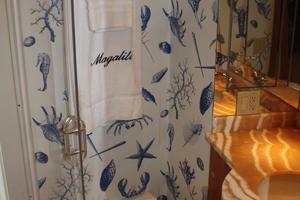 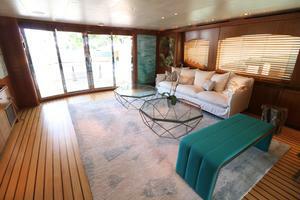 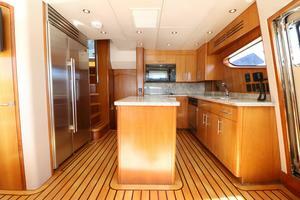 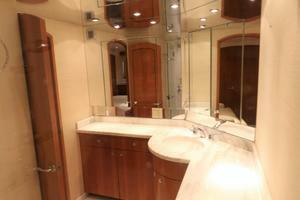 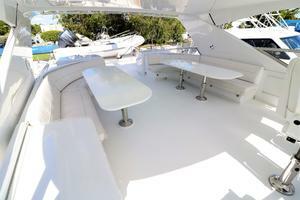 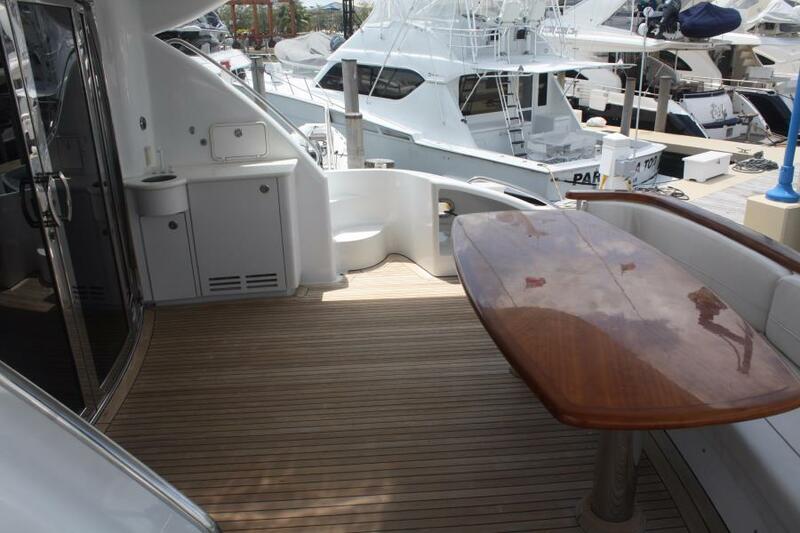 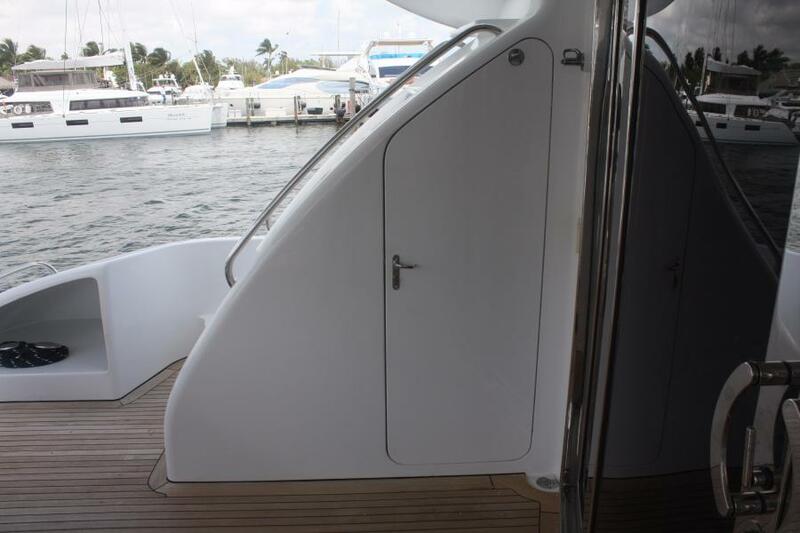 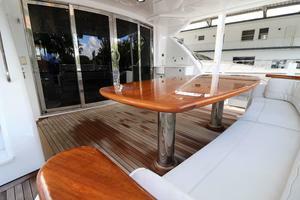 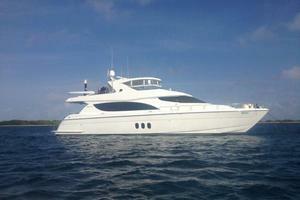 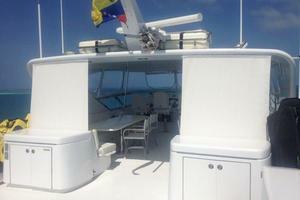 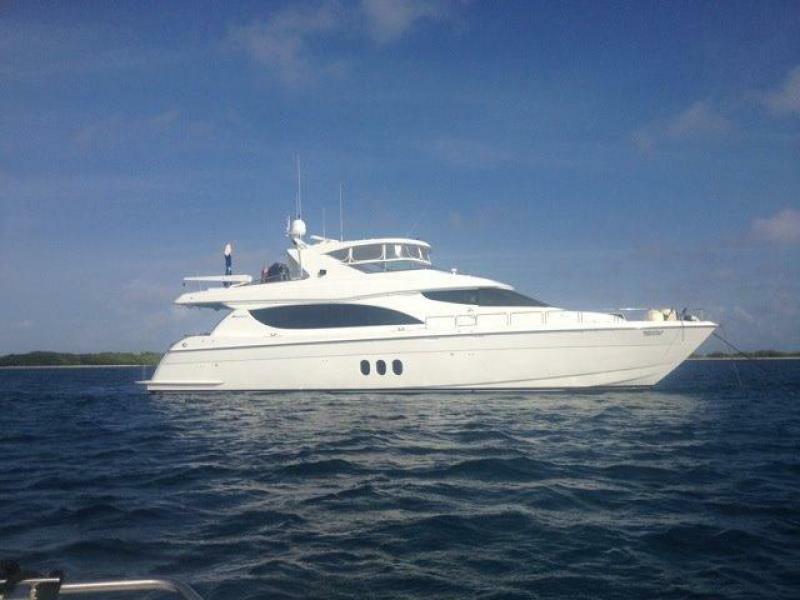 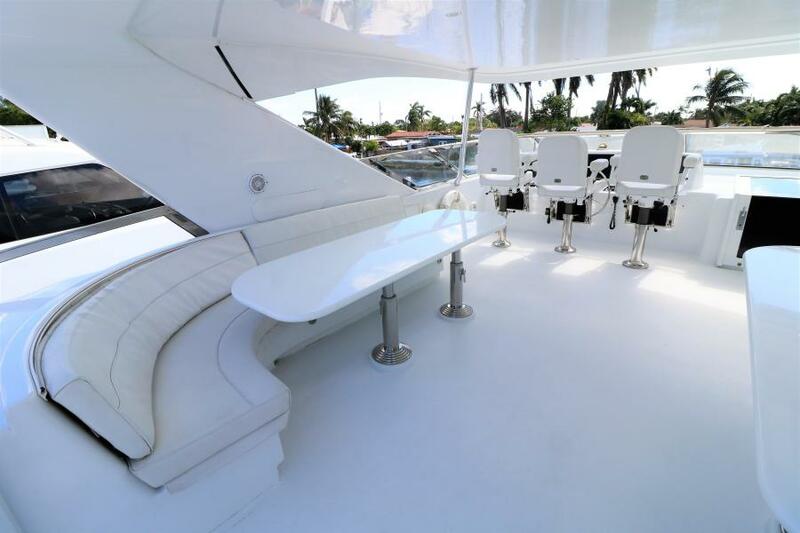 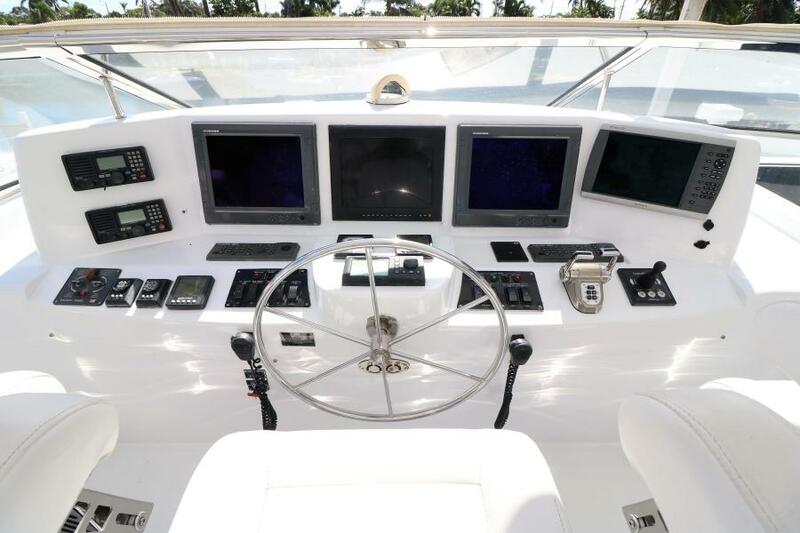 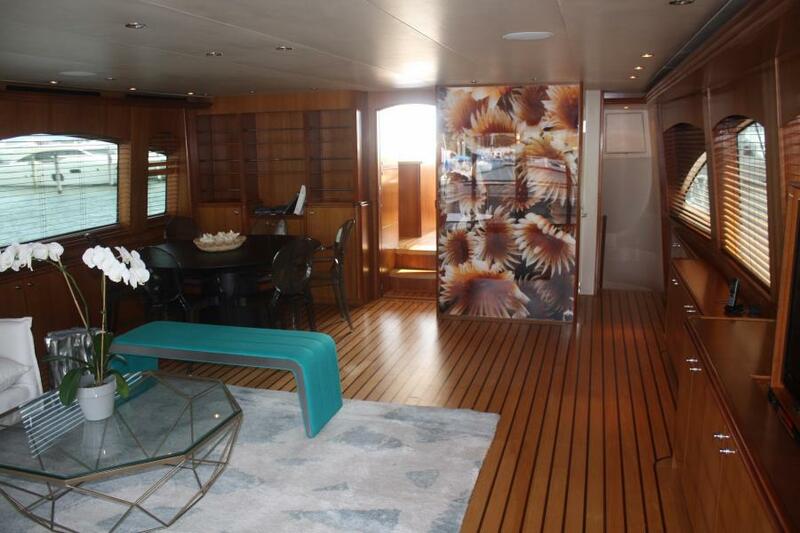 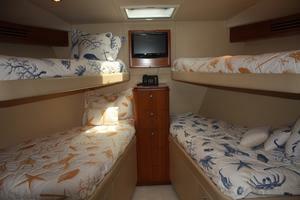 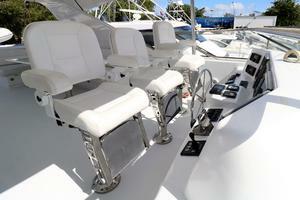 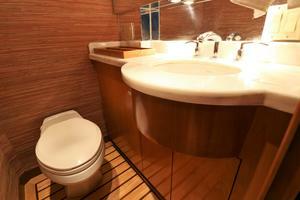 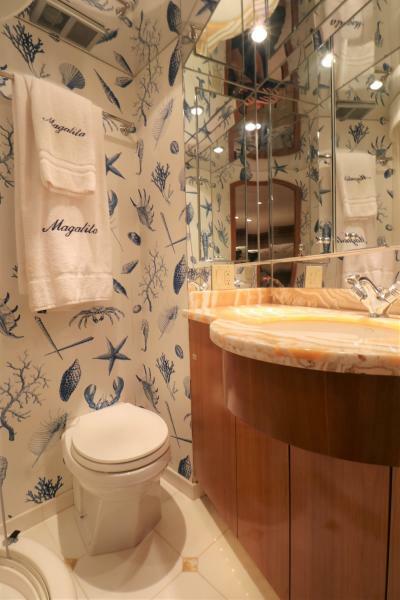 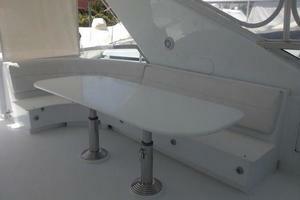 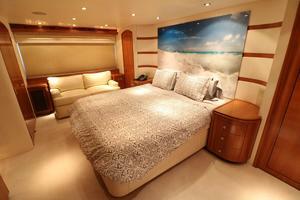 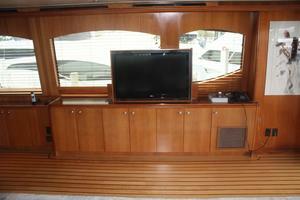 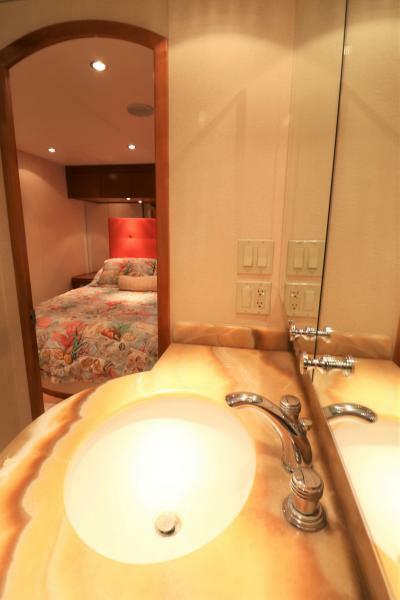 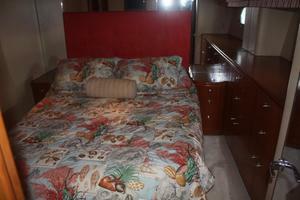 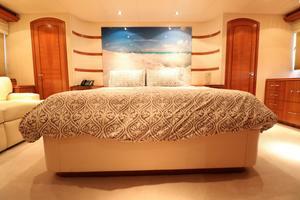 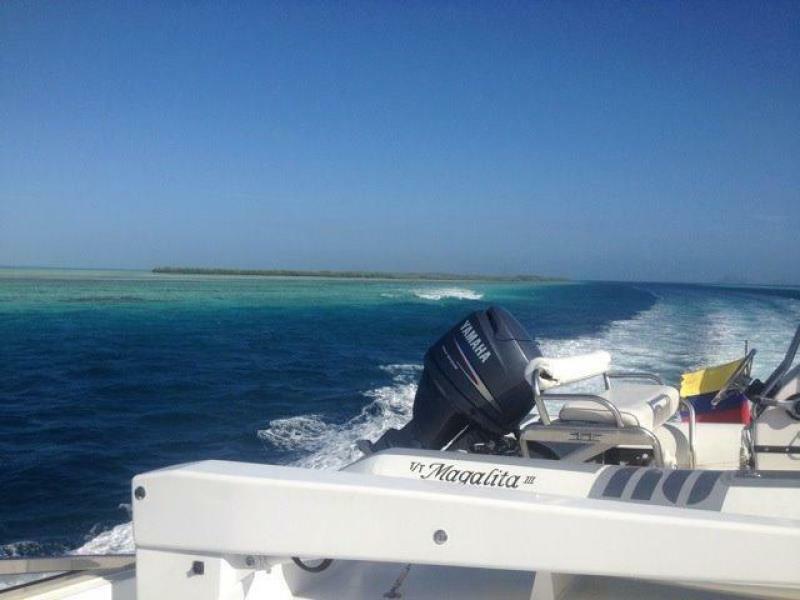 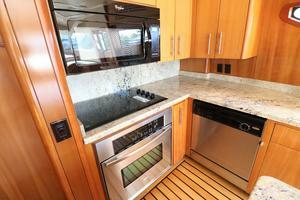 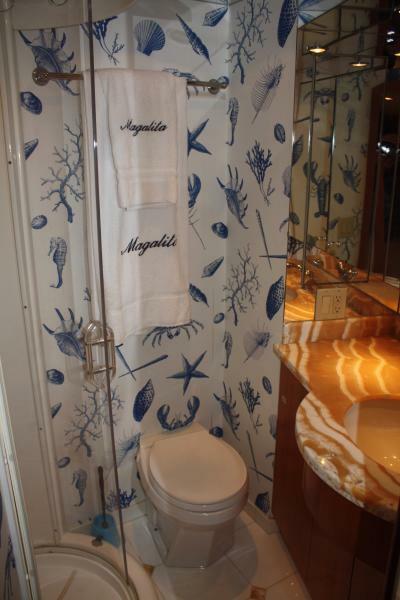 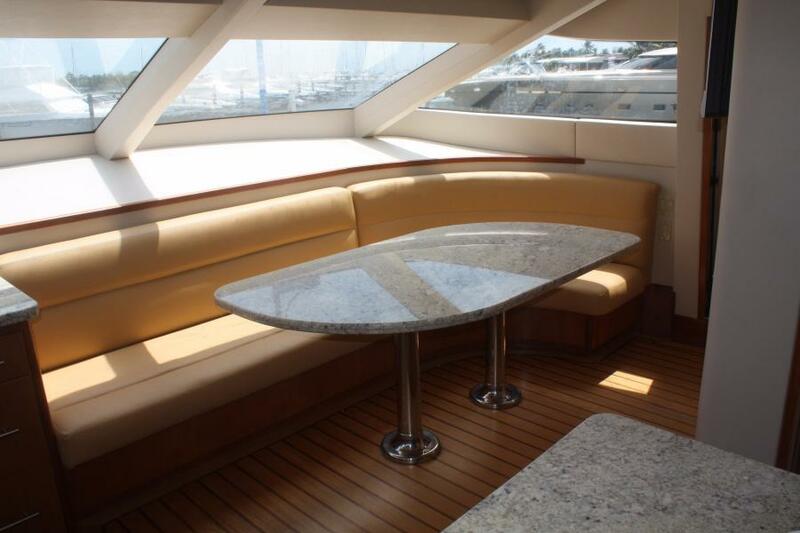 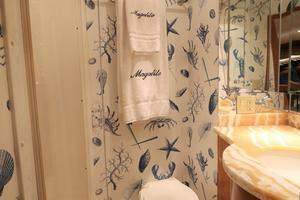 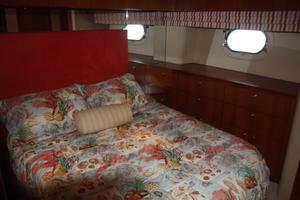 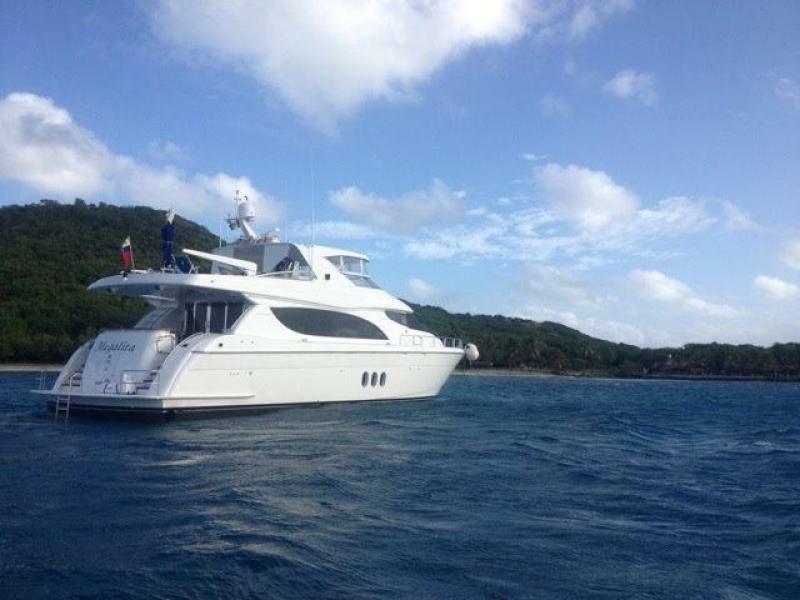 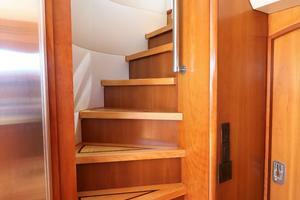 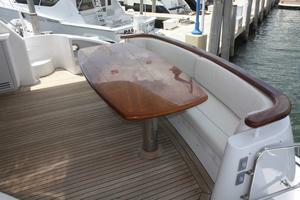 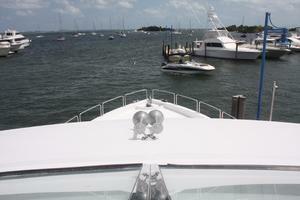 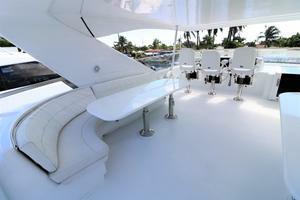 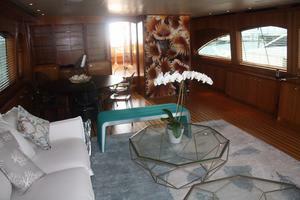 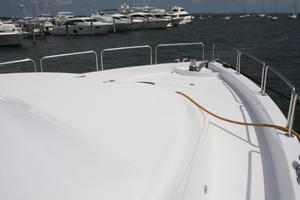 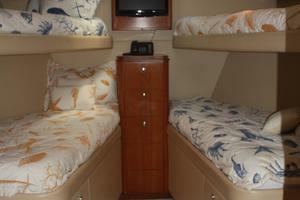 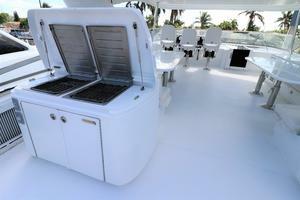 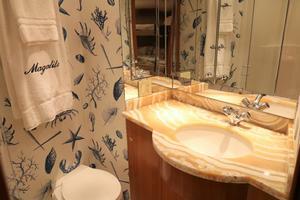 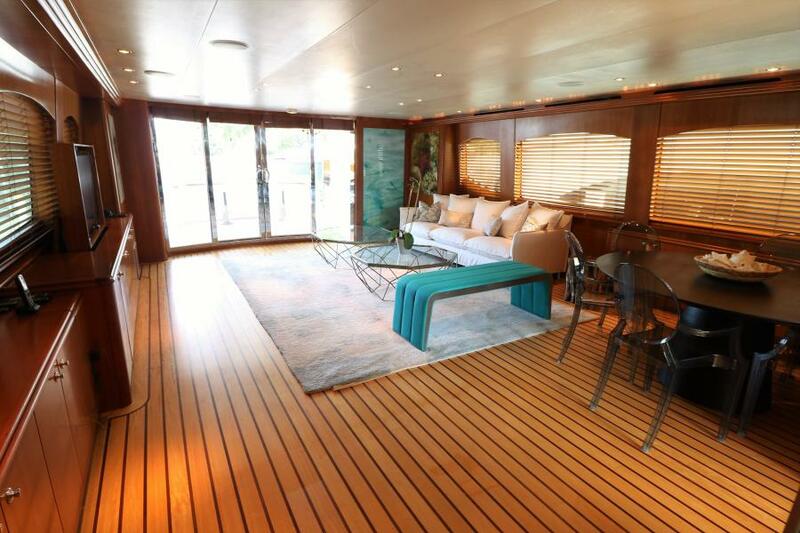 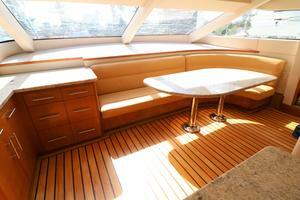 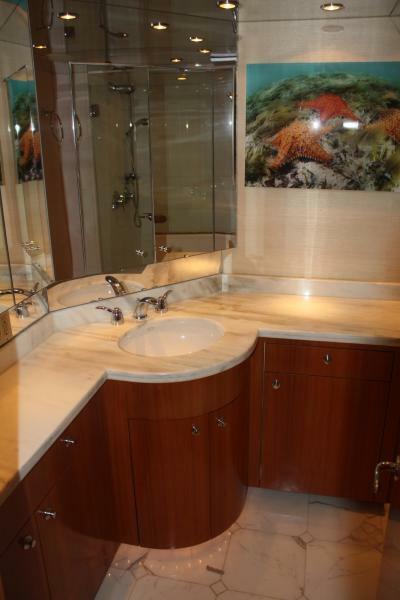 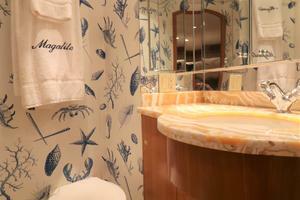 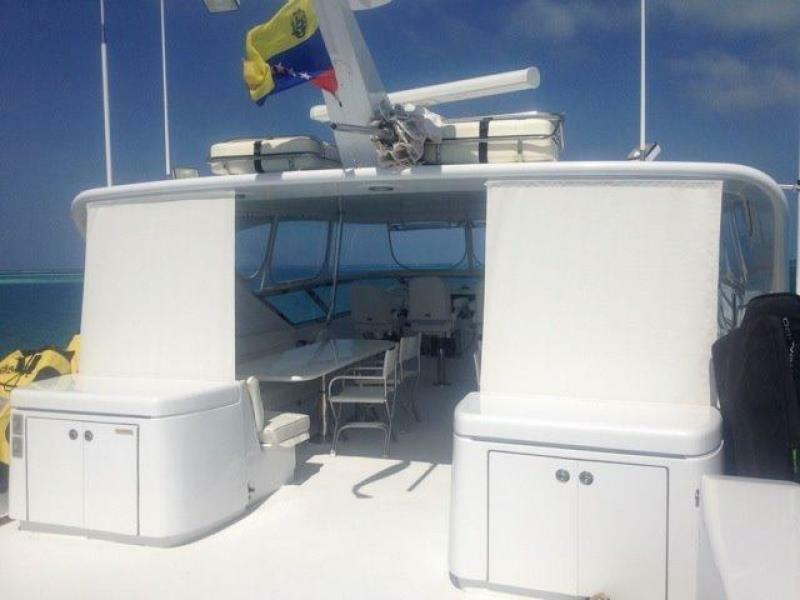 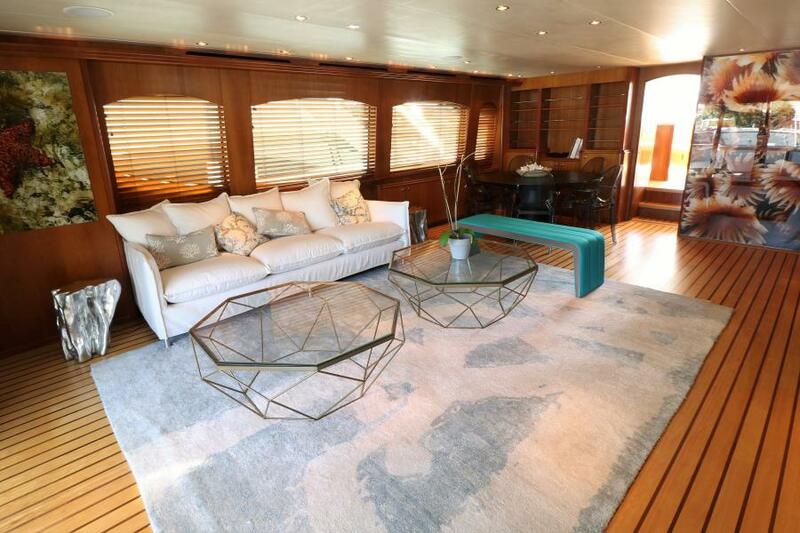 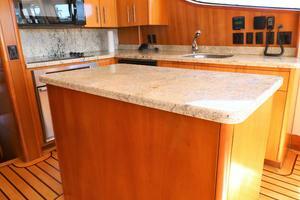 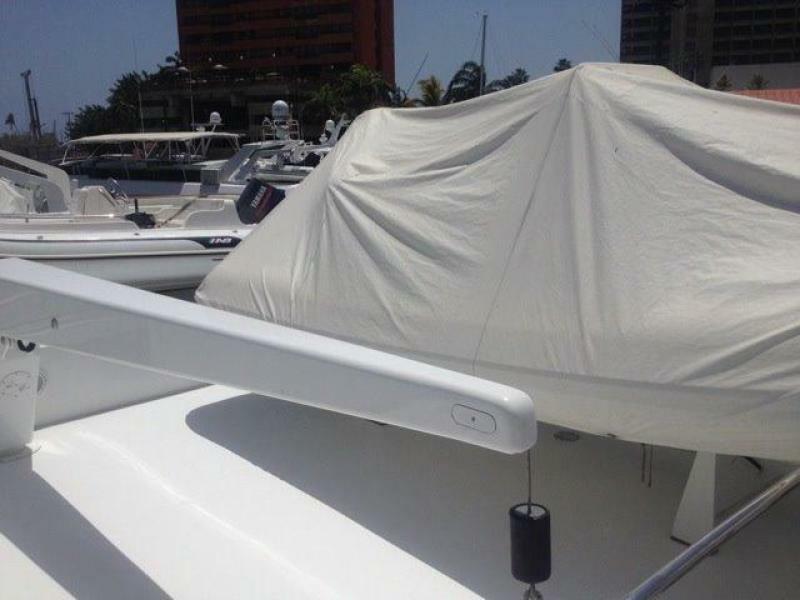 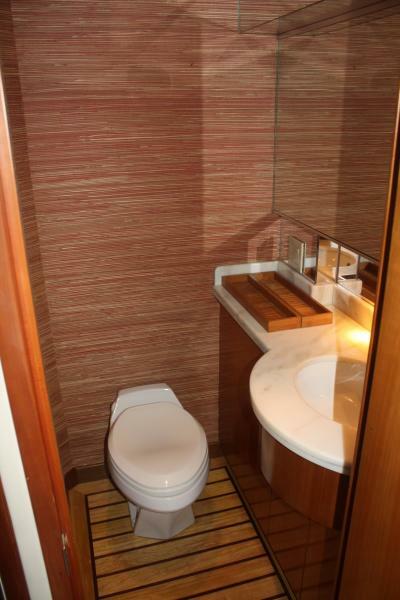 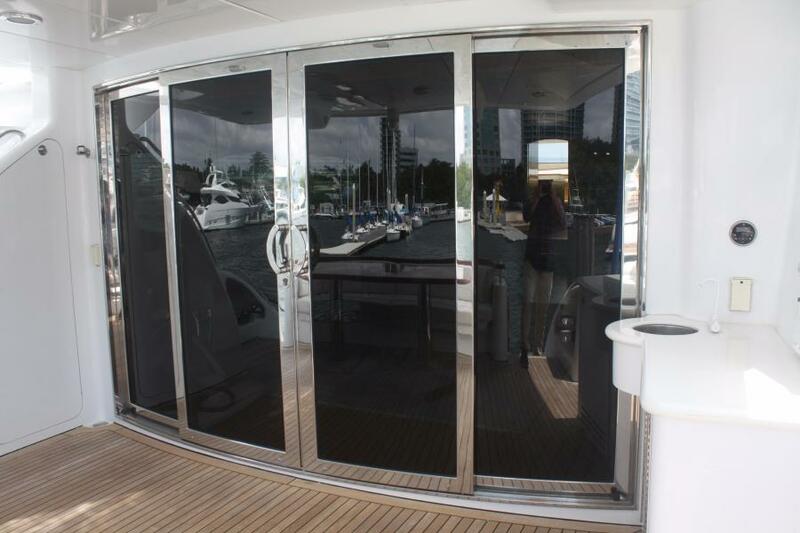 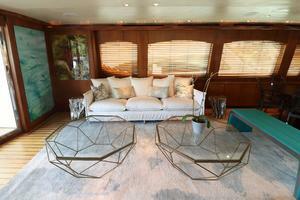 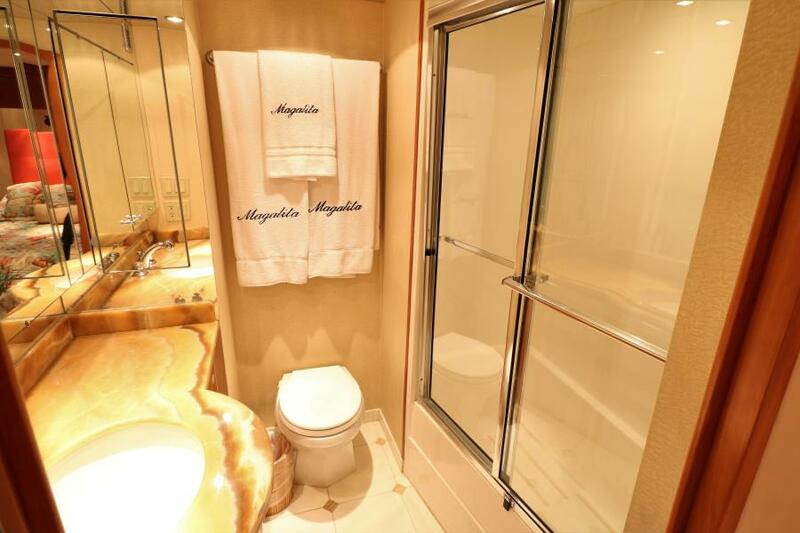 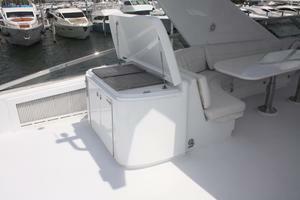 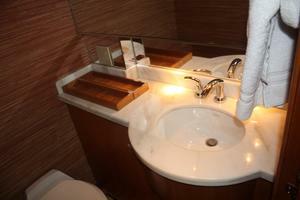 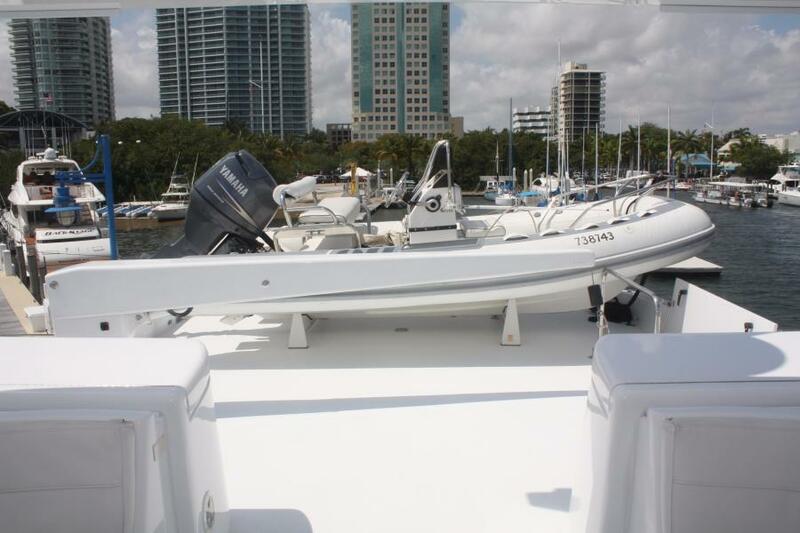 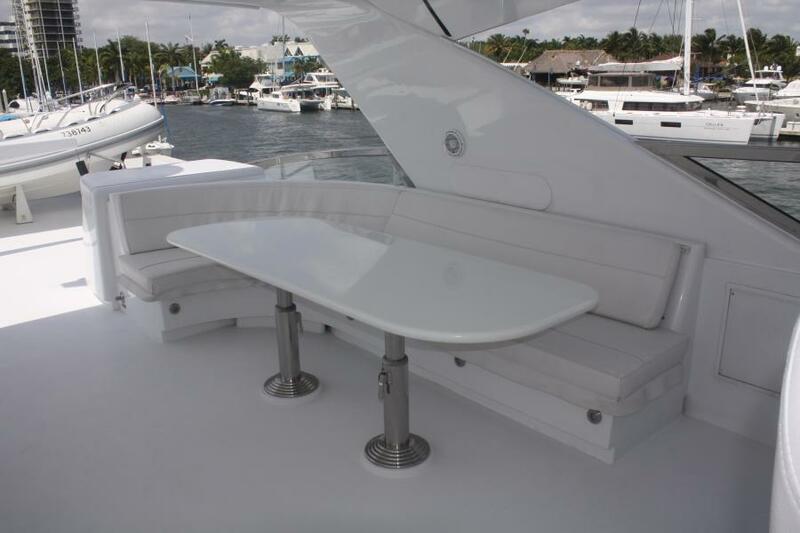 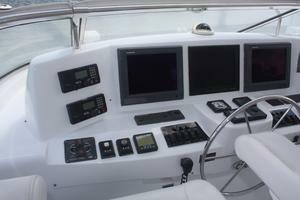 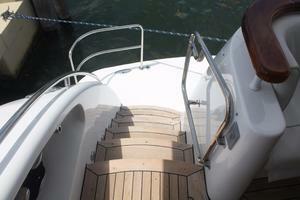 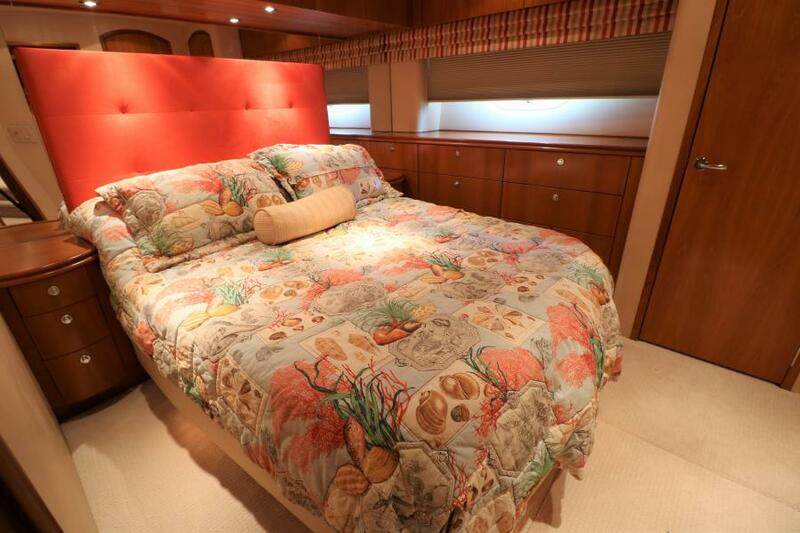 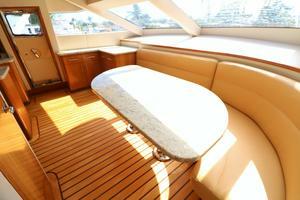 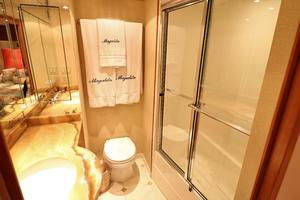 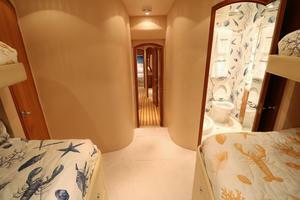 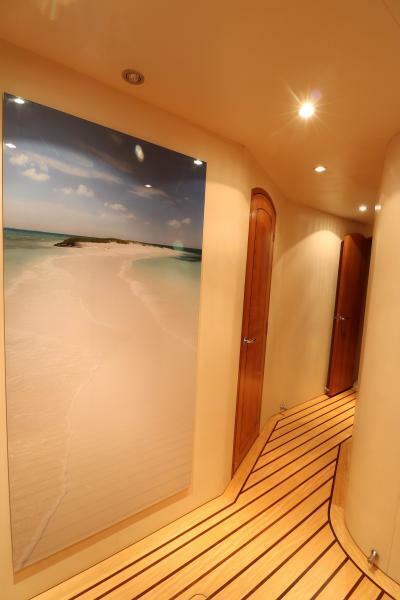 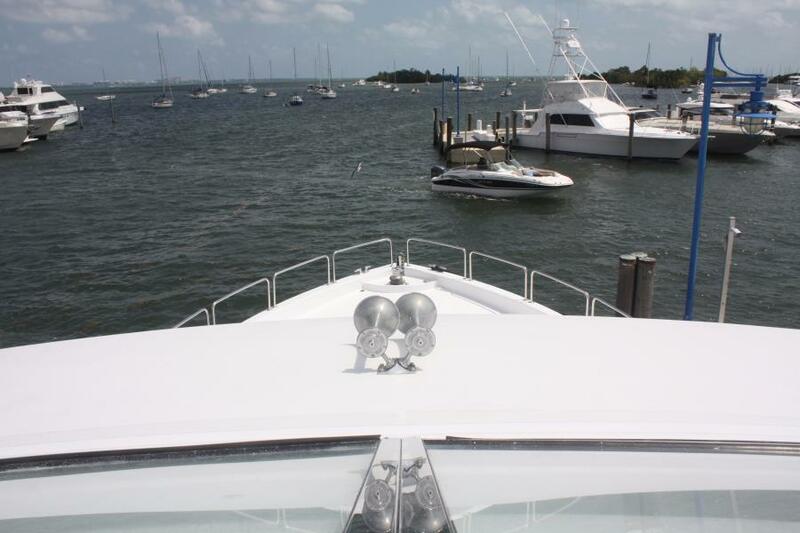 This yacht for sale is located in Miami , Florida and priced at $2,025,000. For a showing please contact us by filling out the form on this page and we will get back to you shortly! The profile of the Hatteras 80 Motor Yacht features sleek lines pleasing to the eye and a hull design that will exhilarate. 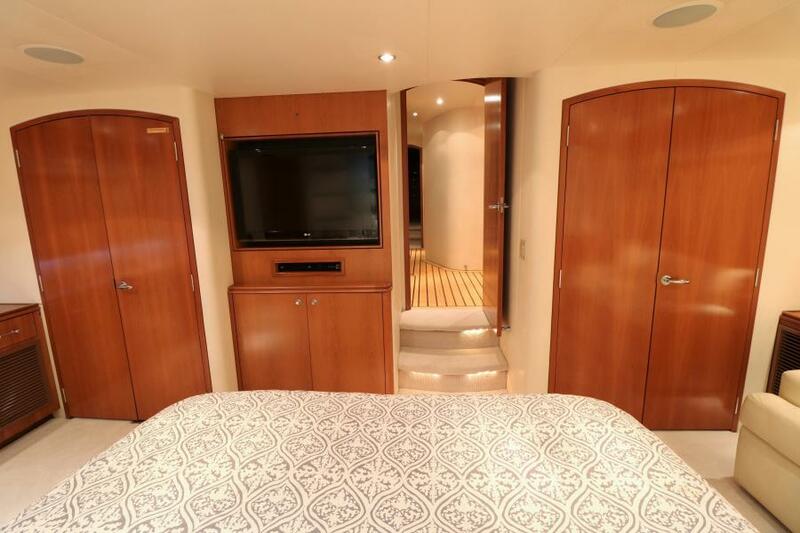 Curved window frames with a swept-back radar arch and triple portholes for the master stateroom combine in an elegant, yet aggressive profile. 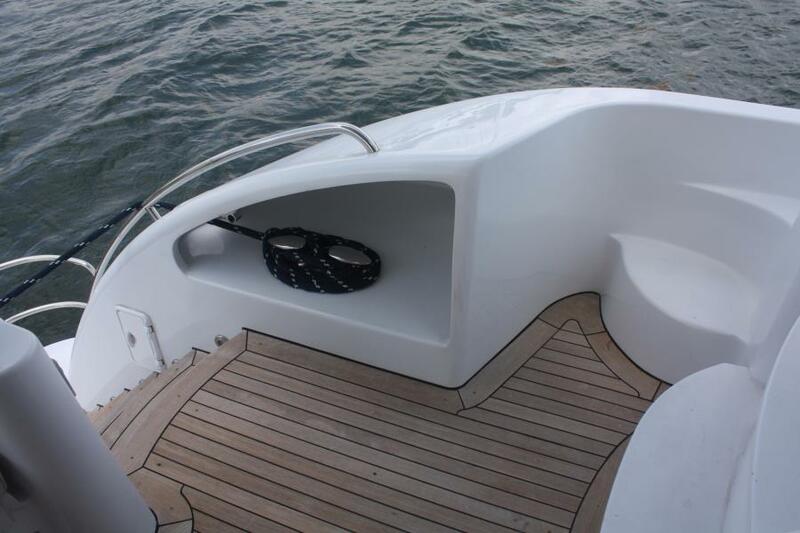 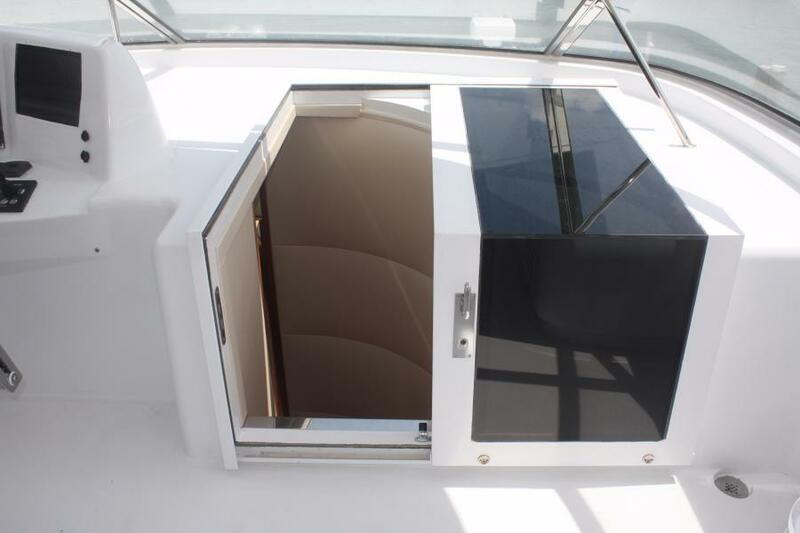 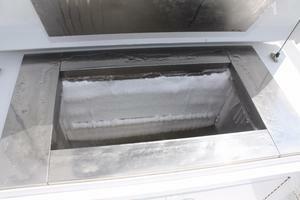 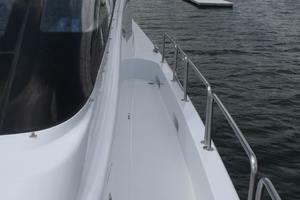 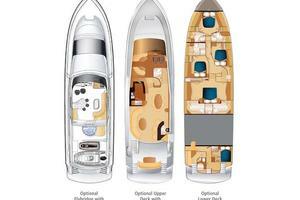 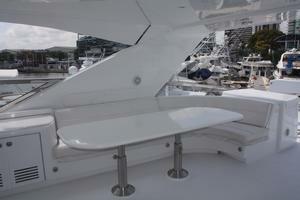 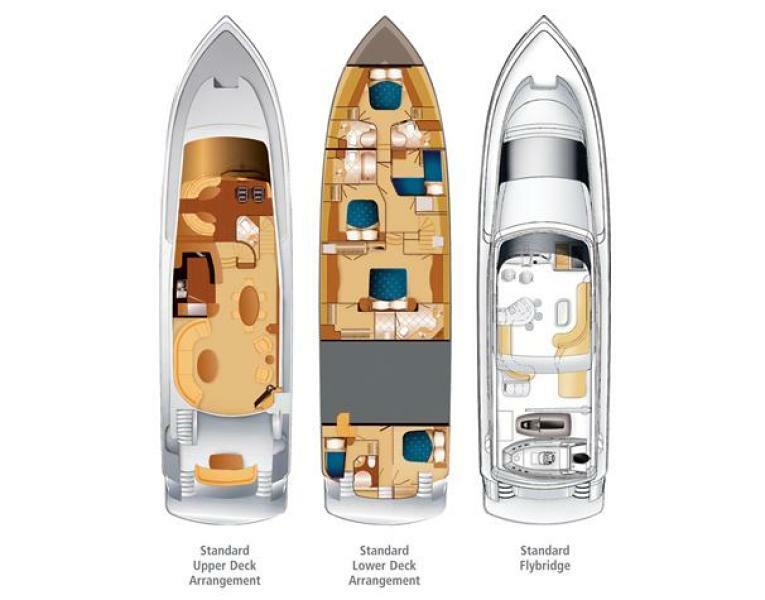 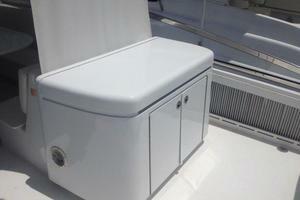 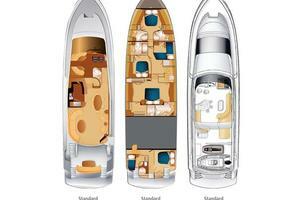 The hull bottom with its concave bow sections and aft prop tunnels will deliver a shallow draft and peak performance. The 80 maximizes your time outdoors with an expansive flybridge that includes a 1,500-pound hydraulic davit and upper navigation station with a full electronics suite and PC Monitoring System. 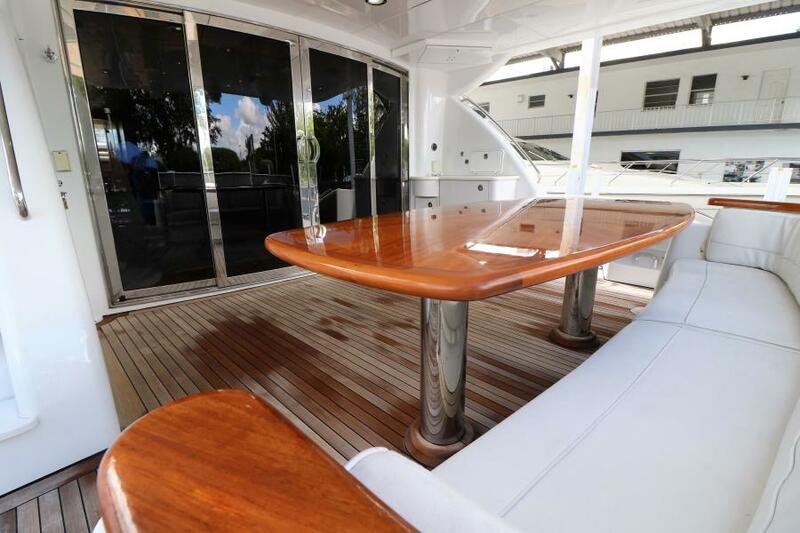 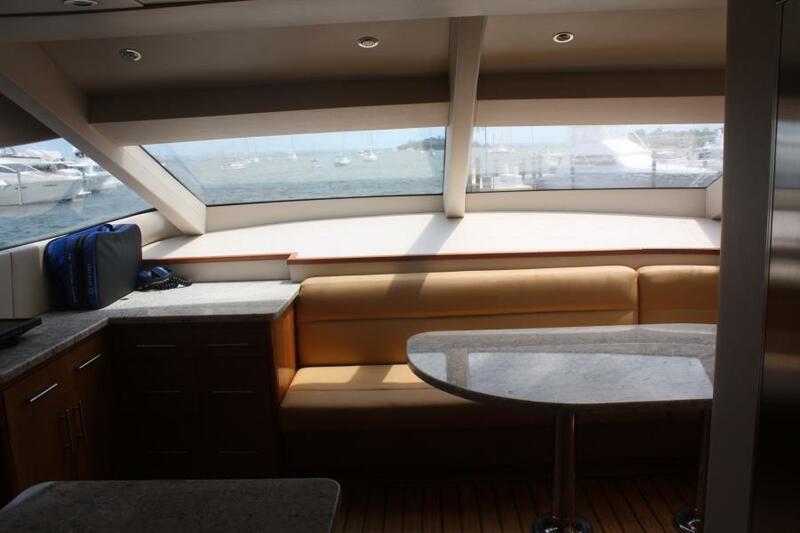 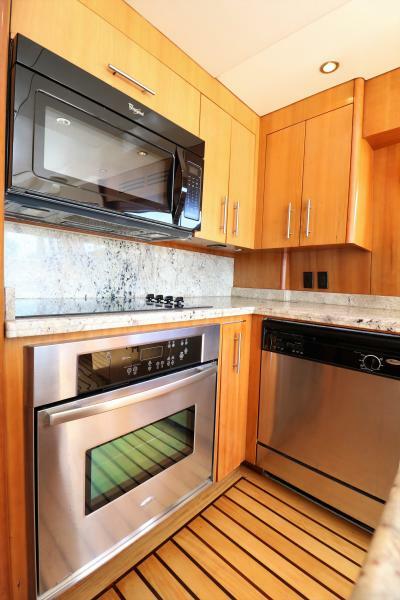 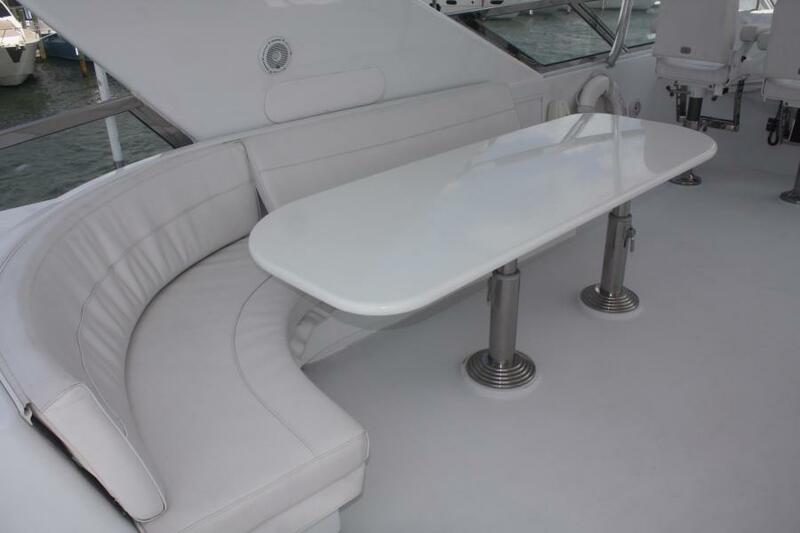 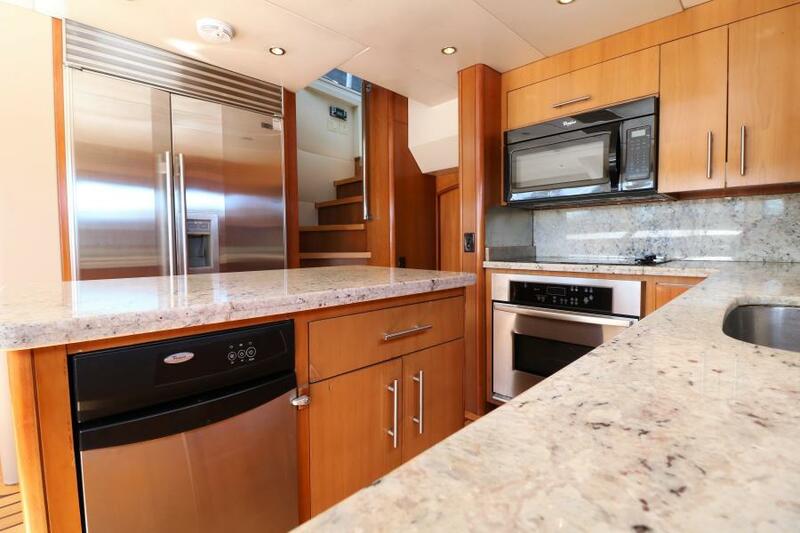 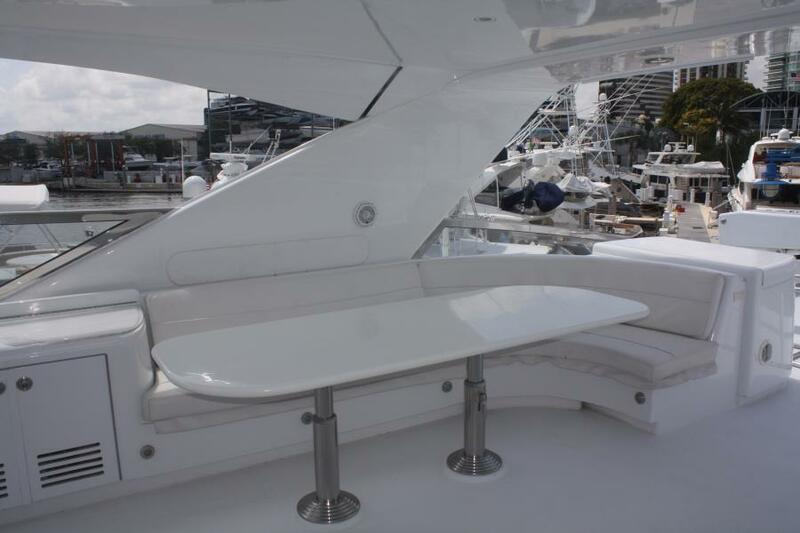 The flybridge includes distinct social areas centered around a wet bar to port that includes three bar stools, refrigerator, sink and icemaker. Opposite and aft of the bar are two opposing L-shaped settees. Sun worshippers will appreciate the aft sunpad with storage beneath, while back-yard chefs will enjoy the double-burner Gaggenau grill. 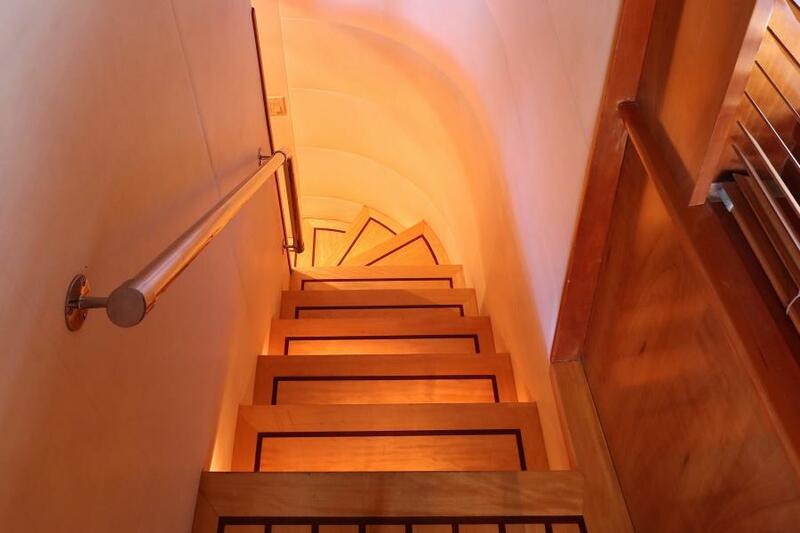 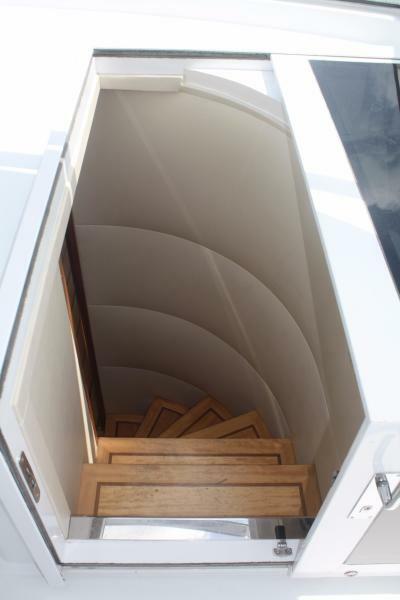 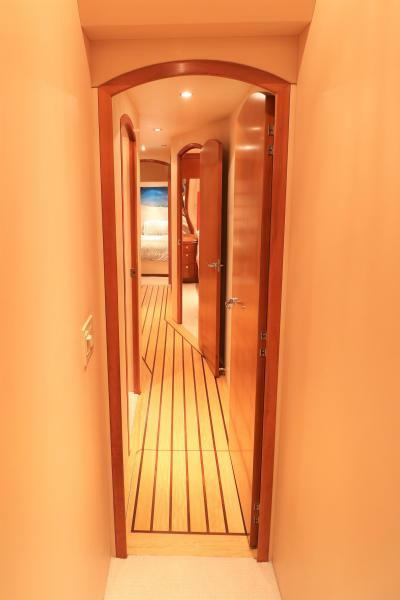 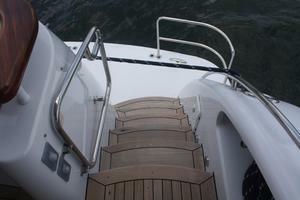 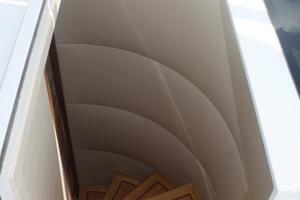 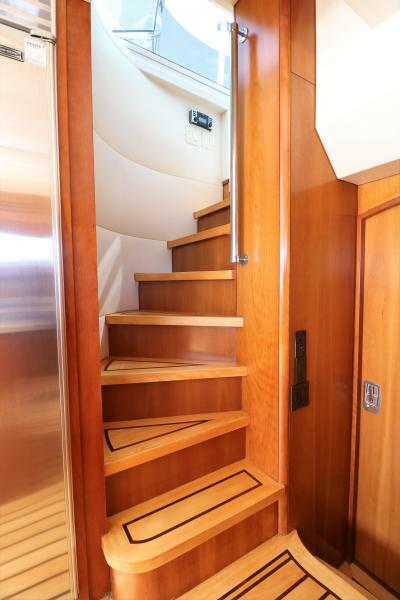 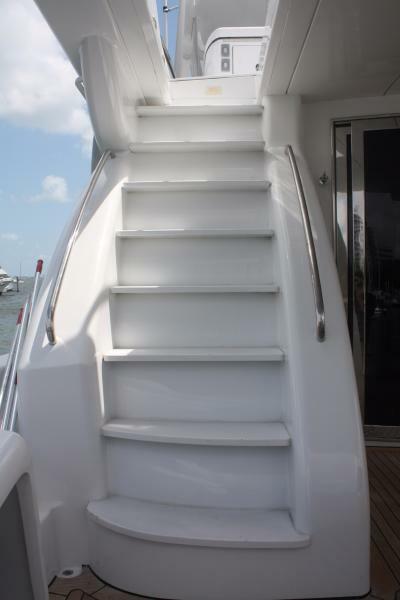 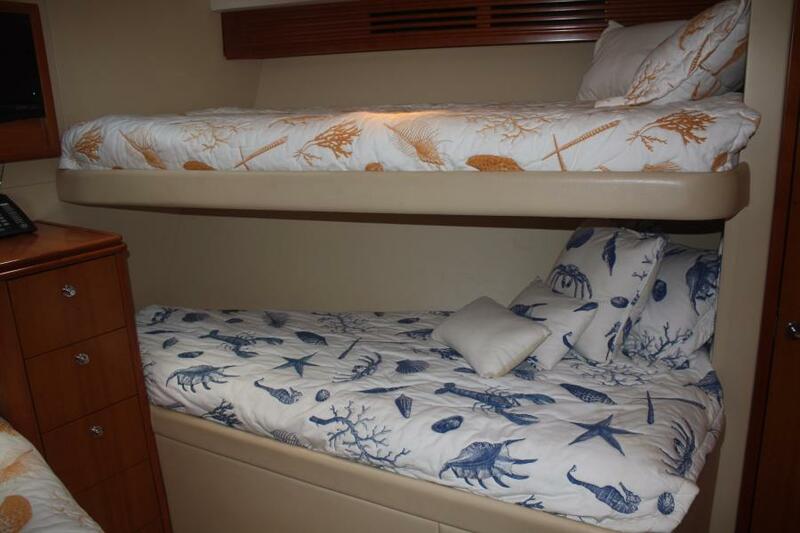 Step down the molded-in stairs to the aft deck, where a large table and molded-in lounge will provide breathtaking scenes at anchor or while underway. 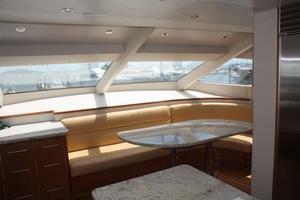 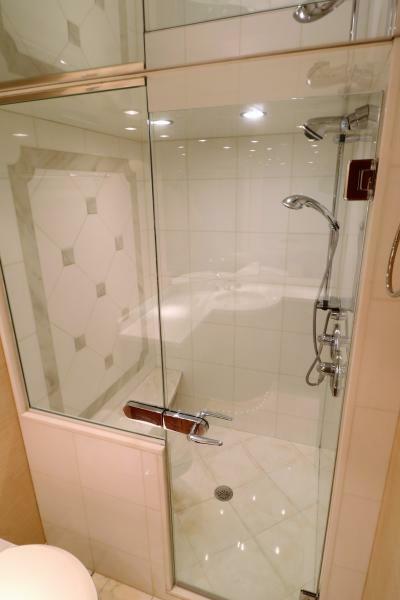 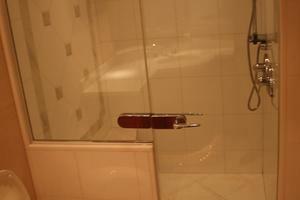 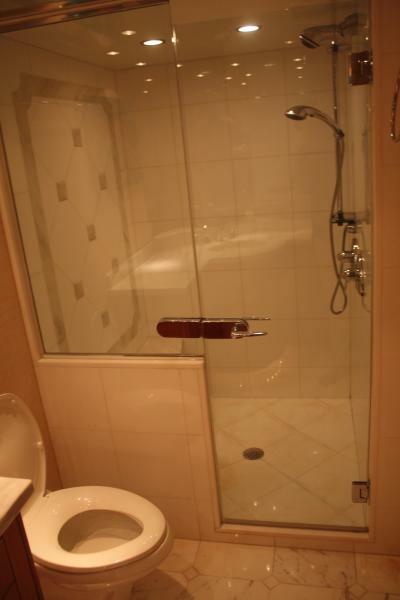 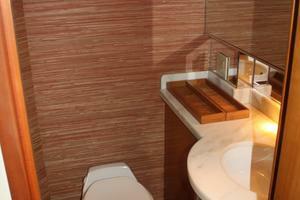 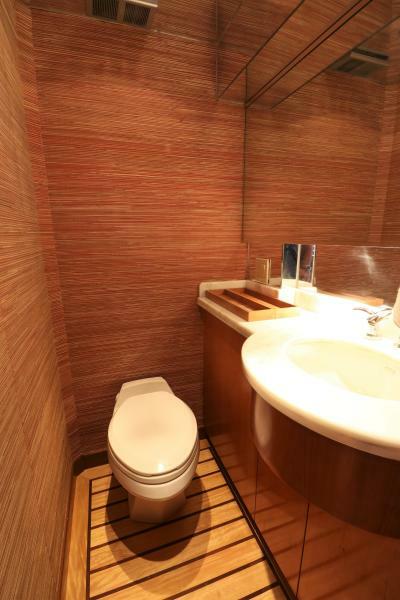 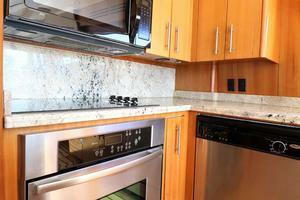 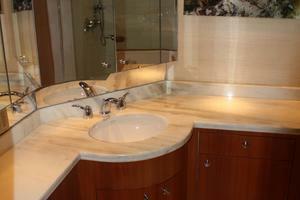 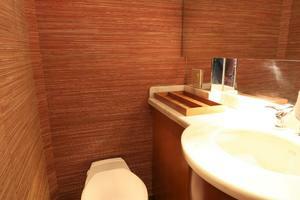 Overhead lighting and a curved, stainless-framed sliding door accent the area. 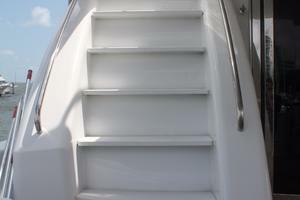 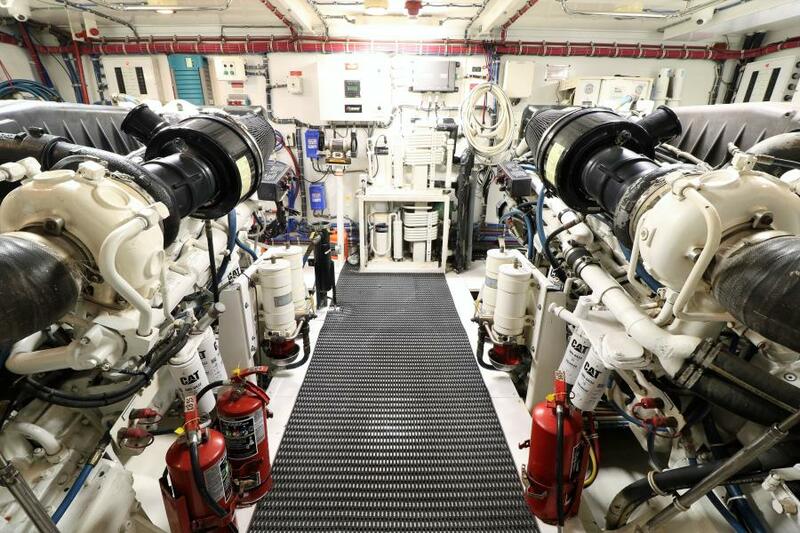 Access to the sport deck is via molded steps port and starboard, guarded by stainless-steel gates, while a door with stairwell provides access to the crew's quarters. 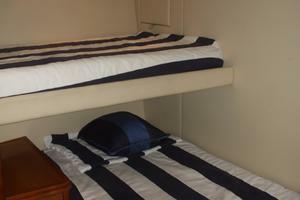 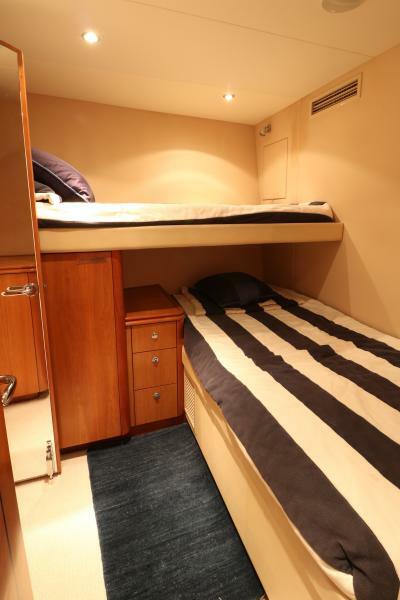 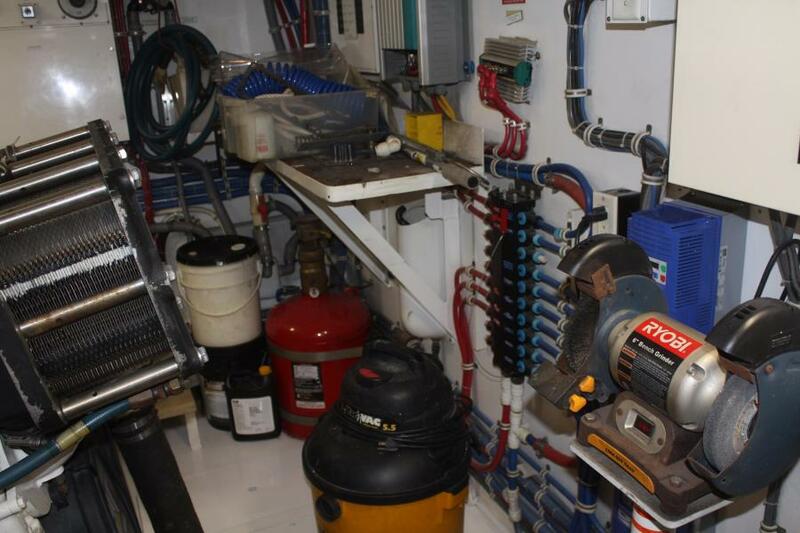 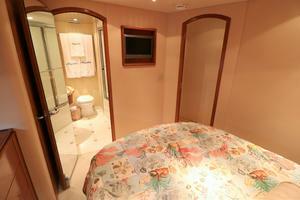 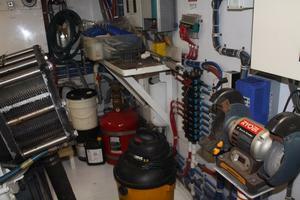 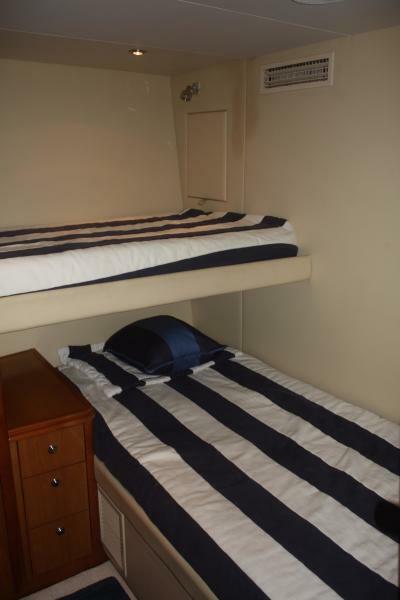 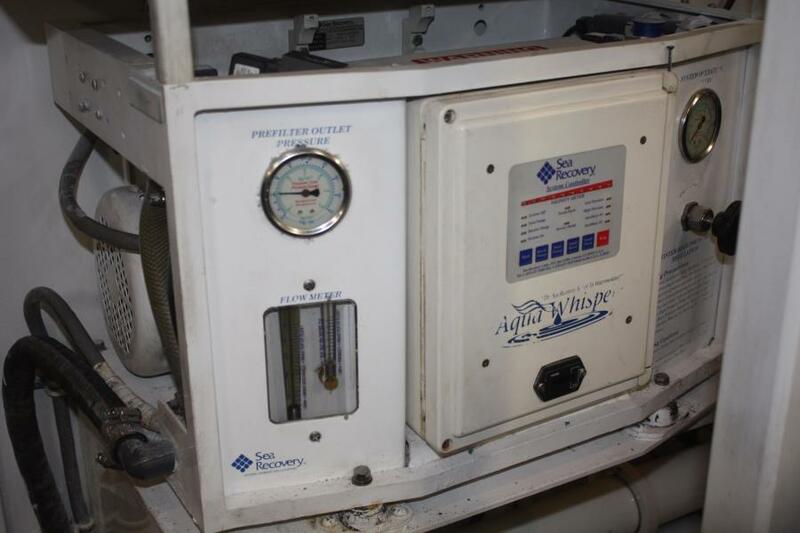 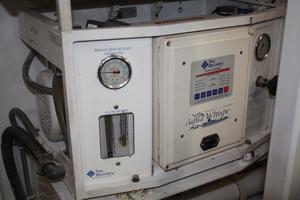 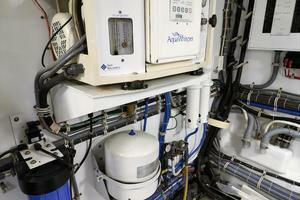 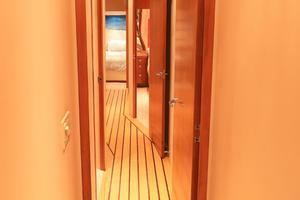 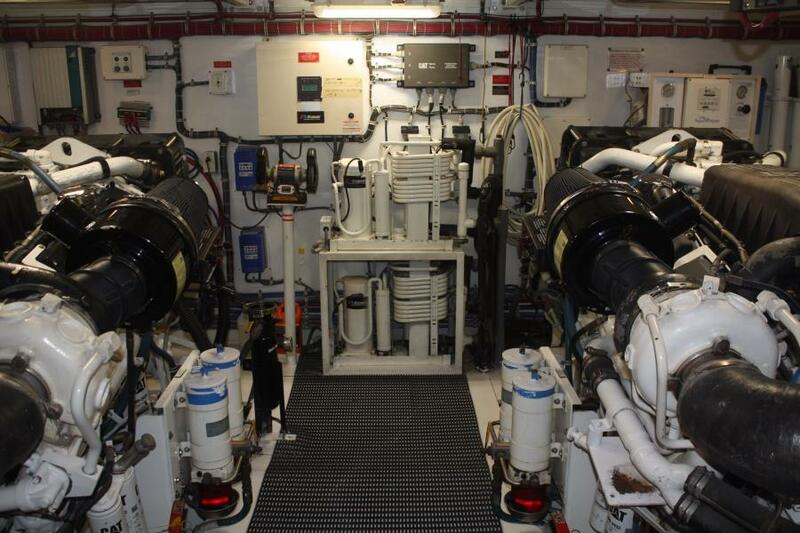 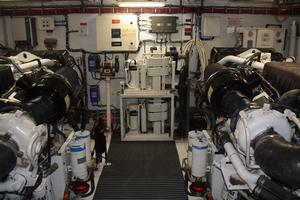 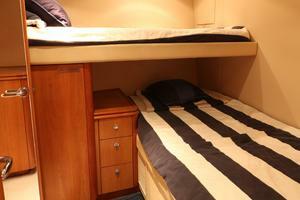 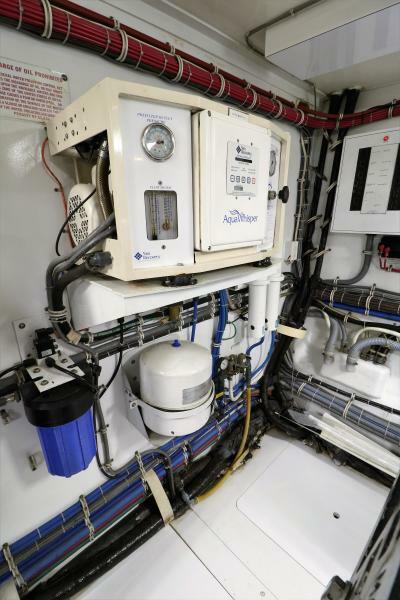 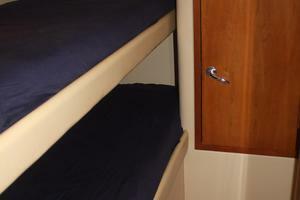 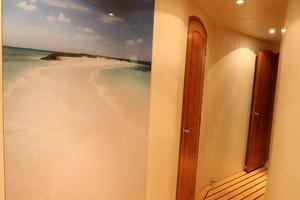 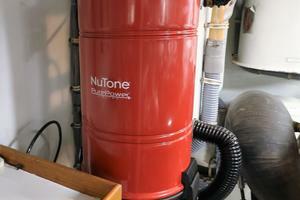 A watertight door on the sport deck provides a second access to the crew's quarters and engine room. 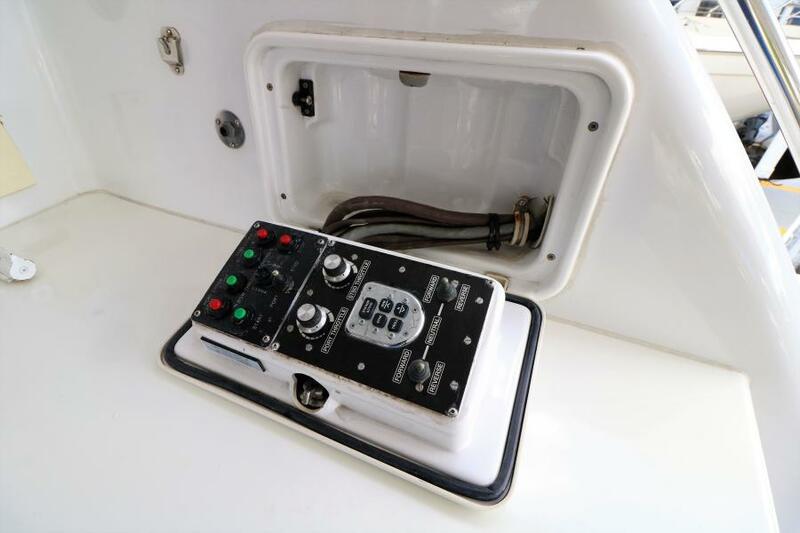 ICOM VHF M604A Radio (2 Units) with extended command Mic.